The Tale of Two Targets: Design Principles in Achieving TOD. Density. For planners and urban designers helping to create transit-oriented developments (TODs), density is the crucial factor in achieving a critical mass for ridership and a mixed-use walkable environment that will entice people out of their cars. In many cases if planners can’t reach that threshold of density than transit is the baby that gets thrown out with the bath water. Density continues to be extremely important to the success of transit, and in looking at the largest cities in the U.S., residential and employment density correlate strongly with the percentage of transit modal share. But increasingly, physical access and the walkable environment of a TOD are getting face time in the transit debate. Reconnecting America, arguably the organization taking the lead in TOD, highlights street design, public space design, and connectivity to transit as must-dos. Even if the density threshold is met, in many cases if these urban design principles aren’t used in land use planning, premium transit won’t acquire its maximum ridership. In working on a corridor plan in southeast Florida, I, along with my project team, are thinking extensively how to retrofit the land use design along a large arterial, that for the majority of its length traverses a low density suburban context. Through our short-term and long-term land use recommendations, we hope that it will be retrofitted to provide better access to the public transportation it currently has, as well as be able to easily become a transit-oriented corridor (TOC) in the near future. In preparing this corridor for its birth as a TOC, we are employing four design principles that I would argue are most effective in creating an environment supportive of transit-oriented development: connectivity, enhancements to the public realm, site orientation, and ground floor design and use. Connectivity is the degree of which streets, roads, and pedestrian routes are joined together. The more connected the street network through a site, the more access and circulation options are provided. If an urban fabric has a high degree of connectivity, it provides many ways for users to navigate their environment and, in the process, reduces the extent to which all travelers must rely on one route. create a physical environment that is conducive to mixed-use development and increase transit ridership. The “public realm” refers to space that is publicly owned, accessible, and maintained. Design enhancements to the public realm along major corridors provide more appropriate facilities for transit, transit-users, and the mixed-uses supportive of transit. Alterations to the public realm along transit-oriented corridors can include improvements to buffers such as landscaping and lighting, enhancement of pedestrian-dedicated space such as sidewalks, and allowance of space for outdoor commercial activities. Site orientation is how buildings are located on a site in relationship to the public realm. In the past few decades, especially along commercial corridors that are designed-oriented for the automobile, parking lots have taken precedence over the building’s relationship to the street. In more urban environments that were developed before mainstream use of the automobile, buildings are located adjacent to the street and parking is accommodated on the street or by more modest lots the rear of the building. Instrumental in creating an urban environment that is conducive to transit-oriented development is an active public realm. Regulating the design and use of the ground floor of buildings adjacent to pedestrian space and transit facilities can have an enormous effect or the safety, comfort ability, and commercial success of the corridor. A co-worker made the observation that many of the sites that host the low density retail product that we were charged with retrofitting along this corridor often shared the same context, plot size, and density. 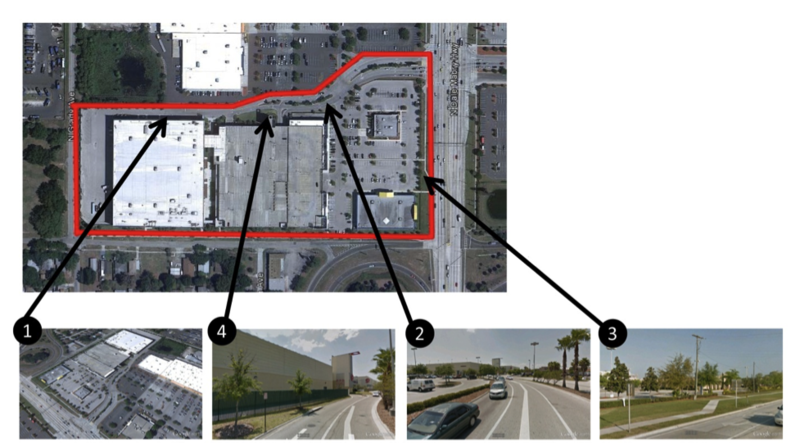 In our research of the design alternatives for traditional big box sites locally we stumbled across two Targets, one in Tampa and one in Orlando, that illustrate the importance of design principles in development along future transit-oriented corridors. 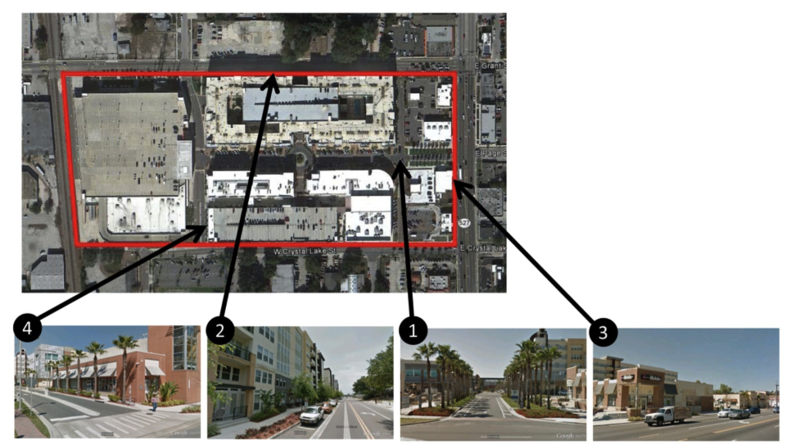 The Target located on Orange Avenue in Orlando however, achieved the same program and density (even more actually) while addressing its urban context and properly employing the four design principles. The difference in the quality of place and access to the urban corridor is absolutely staggering. Site Orientation: Instead of placing suburban outparcels along the corridor, buildings are placed directly fronting the sidewalk. While they do not achieve a density desired on a TOD corridor they do create a more urban and walkable character. Ground Floor Design and Use: Solid walls are avoided where possible. Facades that face the public realm are majority fenestration and provide active uses adjacent to open space. 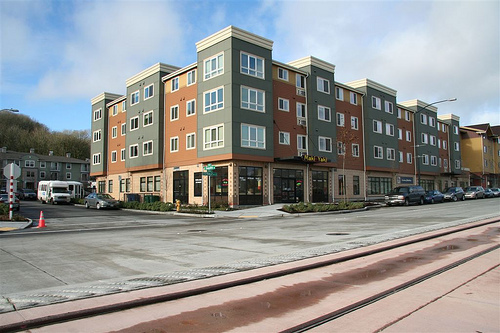 These two development examples illustrate how important required design standards are in achieving a land use and pattern required of transit-oriented design. While many design principles could be put in place along designated transit-oriented corridors, requiring connectivity, a well-designed public realm, active ground floor uses, and site orientation will achieve a high-quality level of development. 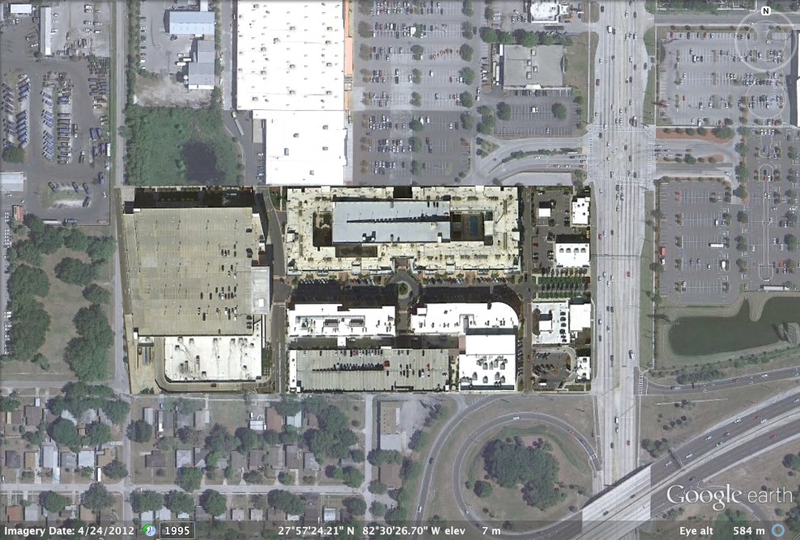 The below picture shows from a site planning perspective how easily the higher quality development in Orlando could be achieved on the same site in Tampa. 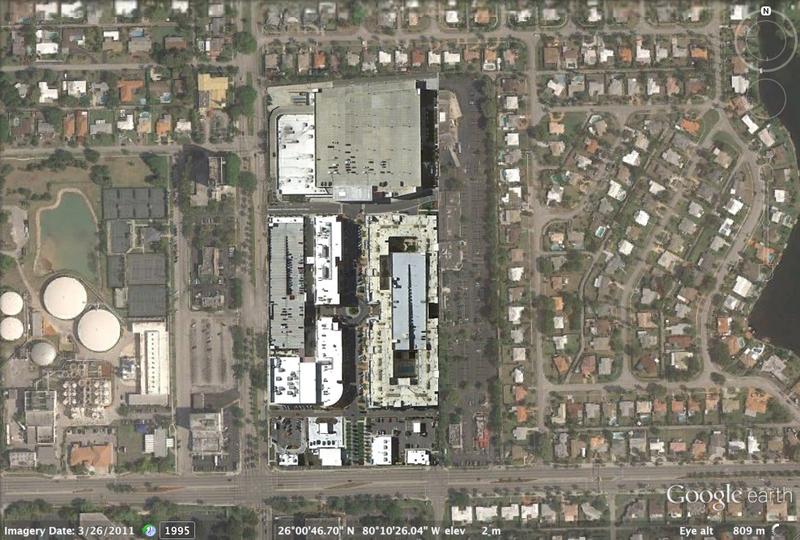 In fact, we realized that this is the case among many Targets, including the one on our corridor in Hollywood, FL. And the Target in my home town of Charlotte. We need to remember that “different” doesn’t always mean better. And while we are making progress in achieving a higher density and more program on a site, we could make even a bigger difference on many of our future transit-oriented corridors if we are just aware of how cities as close as an hour away are integrating the same big box products. While density certainly lays the foundation for a rich TOD, its optimal success is dependent on the quality of place achieved by traditional urban design. Why Your Gas Tank Matters: An Alternate View to Public Transportation. I’m sure it’s been beaten into your head by now that driving your car is bad, and that the more enlightened choice is to take public transportation. We’ve all heard the stats of pollution and we know that the built form being designed around the car has destroyed a walkable environment based on nuclear neighborhoods. We’ve abandoned the charm and livability of almost all of our cities, and it will take centuries to get them back. The car does take a lot of the blame. As an urban designer I’ve been battling with this guilt, especially in a city that offers some of the worst public transportation option in the country. In addition, we have the third highest rate of pedestrian fatalities in the country. And of course, professionally, I’m expected to want to use public transportation, cycle, and walk. It’s so inconvenient and inefficient, that for me (like most Americans) it is not an option. And I certainly don’t want to use it in its current condition. From my years living in England, I know what really good public transportation looks like: headways of 5 minutes, perfectly timed with trains, and mixed-use walkable downtowns. You could go almost anywhere in the country on your own two feet. But it cost a hefty price, and in many cases for me, became unaffordable. And as cliché as it sounds, Americans do enjoy their “freedom,” which for many is synonymous with their car. This culture shift is a way of life, and changing it is a battle I don’t think we will see in our lifetime without an enormous federal commitment to projects that we haven’t seen since after World War II. I don’t know about you, but I’m not holding my breath on that one. So where does that leave us? Last week at a red light, I looked down at my gas tank and it occurred to me I hadn’t filled it up in 2 months. I realized that even in a city that is the most auto centric place I have ever lived, it is possible to not get out of your car and have a very tiny carbon footprint. Urban designers and planners strive for perfect development: walkable, tree-lined streets, beautiful public spaces, and a car-free lifestyle. We search for this in our own personal lives, and in most cases we come up shorthanded. Unless you live in New York, Chicago, Portland, Seattle and San Francisco (our country’s gems) we often feel unsatisfied. However, I believe you can stay in your car (gasp!) and choose just as valuable of a sustainable lifestyle. Choose to live near your work, or second place. At its worst my commute was an hour and fifteen minutes one way, and at the end of the day I felt depleted. I promised I would never do that to myself again. So, when I moved to Tampa, I chose to live 2 miles from my work place, which is located Downtown. My other criteria was that I’d like to be able to walk to get a cup of coffee. As a result, I live in a denser neighborhood (made of mostly single-family homes) that is built on a connected street grid and is in close proximity to other neighborhoods that surround the downtown core. Each of these neighborhoods has a small commercial center that has the basics: grocery store, restaurants, coffee shop, etc. A few of the other necessities (Target!) are located on major arteries on the outside of these neighborhoods. I travel in between these mid-town neighborhoods and downtown. Granted we live a geographically small life and look for little entertainment outside of going to the movies and having a nice dinner, we are able to fill our gas tank up very infrequently. The following graphic shows the Tampa city limits in orange, and in blue, is the part of the city I actually use. I’ve chosen to live in a slightly smaller house on a smaller lot. I’ve chosen to redefine “what I need” and really look at what influences my life the most. I put a lot higher value on not commuting then I do housing square footage. Life is a game of tradeoffs, and just through my daily life preferences, I have defaulted in choosing the “land use” option to sustainability. Almost any time I go anywhere (except to get a cup of coffee of course,) I get in my car. And I don’t feel bad about. I drive in an entire week, what some of my colleagues might drive one way to work in a morning. While I can’t access what I need by public transportation, all of my needs are in close proximity. This illustrates that land use must be considered along with transportation. I live in an older part of the city where development is denser. Large subdivisions and enormous shopping centers don’t exist. So for a Tampanian, who might be waiting on efficient public transportation for a very long time, the other option is to make choices in your life so that you don’t NEED to feel guilty about not using it. And of course, my lifestyle, while by no means always occurs along those walkable, tree-lined streets, demonstrates how important density and diversity of uses is on the environment. Worse than the invention of the car and the pollution it creates in itself, is the land use form that followed it. 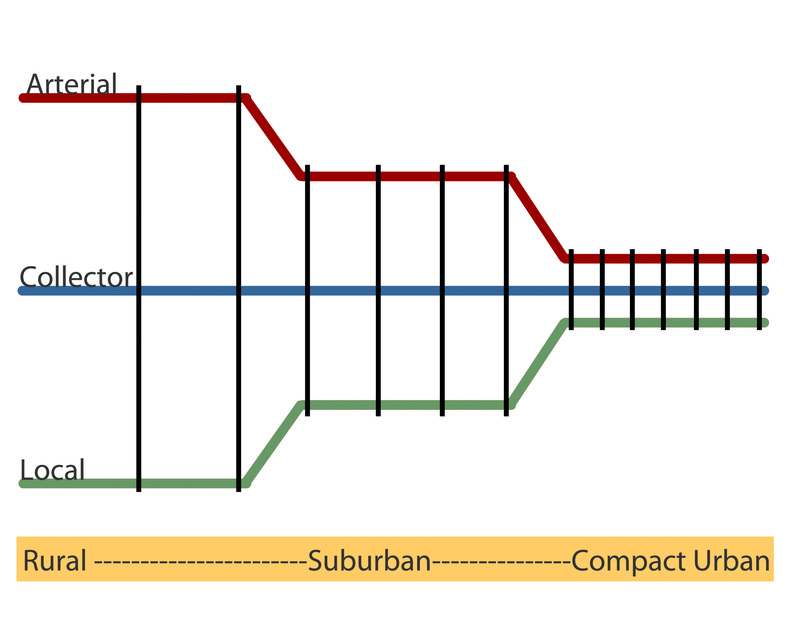 Its disconnected street grid, single-use, and large size made public transportation impossible, and even travelling in a car inefficient. Now of course in some of the largest cities, living near your work is unaffordable, or perhaps the public schools are not of an acceptable quality. And that might be the case. My lifestyle of choice would not be possible everywhere. And this is why transportation modes like BRT and light-rail are crucial to every American city. Slowly, and in some cases very slowly, we are making small progress to get there. But in the meantime, planning policy can ensure that we require mixed-uses in close proximity to new development at the densities required for a sustainable lifestyle. In the meantime, walk or cycle if possible, if you want to. But if you live a geographically small life, and you want to stay in your darn car – don’t sweat it and sleep soundly at night. You are one of the good people. In a series of posts part of the Congress for the New Urbanism‘s City Spotlight Series, members of CNU Tampa Bay will examine the current conditions of Tampa, urban trends and the initiatives (or lack thereof) put in place by the city, and how CNU can meet these needs. In this third post of the series, Jared Schneider, a planner in Tampa will examine transportation networks within downtown Tampa. What makes cities great? In my opinion, many of the great cities of today are what they are because of an innate desire to change the status quo. It comes from the passion, caring, and vision of good leaders as well and residents to say, can we make our city better? It comes from the investment and civility of the business community. It is this attitude and culture of caring, I believe, that makes many cities great. Often the tough decisions involve transportation related issues within downtown areas that have an impact on the linkages between the surrounding built environment and open spaces. In particular, many great cities have invested in a wide range of transportation choices to provide a holistic transportation network as well as to instigate redevelopment and provide improved connectivity. CNU has focused on this topic through its Project for Transportation Reform. Specifically, I feel that CNU’s Designing Walkable Urban Thoroughfares and Transportation Networks initiatives can help serve as guides to providing transportation options in downtown Tampa. Previous articles in this spotlight series have highlighted Tampa’s transportation challenges as a City of Corridors and Tampa’s past as a bustling urban center dependent upon a robust streetcar system. This article will focus on downtown Tampa and the challenges of providing a suitable transportation network for pedestrians, bicyclists and automobiles. 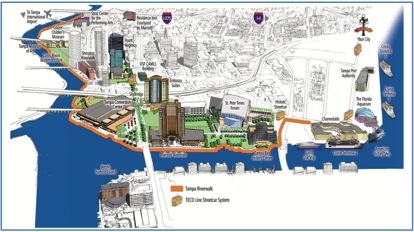 The article will also highlight recent transportation advancements in downtown Tampa. Similar to many downtowns throughout the country, the transportation network in downtown Tampa mainly functions to move cars in and out as quickly as possible. There are a number of wide, higher-speed roadways and an abundance of surface parking lots, indicating to visitors and residents that the automobile is a priority and pedestrian and bicycle activity is secondary. This has had a dramatic influence on land use and the built environment in downtown and the surrounding neighborhoods. That being said, many of the greatest cities in the world have wide roadways as well, but where some of the most famous cities differ is that they provide a balance of transportation options and often do a great job of providing parking opportunities that don’t adversely impact urban form. Similar to a number of other downtowns, Tampa has seen resurgence in recent years in new residential developments in the downtown area – the developments of Channelside and Encore, as well as the Skypoint and Element Towers. The success of these developments will rely on providing a balance of transportation options to support the population increases in the downtown area. One of the things that I have experienced while walking around downtown Tampa over the last 7 years have been the missed opportunities to make some considerable enhancements to the existing transportation network. It makes financial sense to hold off on making major design improvements until they can be coupled with scheduled roadway maintenance or planned infrastructure upgrades such as stormwater/drainage improvements, landscaping improvements, and roadway re-surfacing projects. Yet in many cases over the last few years, these projects have been completed without taking the opportunity to improve the design of the roadway by enhancing pedestrian mobility, adding facilities for bicyclists, or to improve the downtown from a landscaping or placemaking standpoint. From the perspective of local government, a lot of this is easier said than done, especially considering the current economic condition and challenges faced when funding projects. When these opportunities arise, thought should be given to whether or not the current condition can and should be changed. When capital projects are identified and programmed, we should be asking what we can do to build a more connected network of sidewalks or bicycle facilities. An overall transportation vision should already be adopted and in place when capital projects are contemplated or when new development is proposed. This vision should include providing safer, convenient connections and crossings for pedestrians and bicyclists as well as access to public transportation. Last year, the City of Tampa embarked on a master planning process for downtown and surrounding neighborhoods. Much of the public feedback received throughout this effort revolved around livable transportation and placemaking. This vision should be built upon and specifics should be developed for how roadways in the right context should be improved when the right opportunity arises. If the opportunity presents itself to improve roadways that have been identified as focus areas, the basic strategies for how to redesign them will already be in place. While attending the Mobility and the Walkable City sessions at CNU 20, it was interesting to hear how several cities have been able to fund and implement pedestrian and bicycle projects. One discussion in particular that stuck with me was how many of the mayors or public works departments implementing these projects have a directive to review all resurfacing or maintenance projects for the feasibility of road dieting to better accommodate bicyclists or pedestrians. It was refreshing to see how these places have a proactive culture to provide more transportation options. These cities understand that resurfacing projects are opportunities to create something better, rather than maintaining the status quo. There were specific projects being implemented or that have already been constructed as evident by the number of bicycle tracks or improved pedestrian facilities such as wider sidewalks or improved crossings which have actually been built. One of the positive initiatives that has been discussed earlier in this series is the City of Tampa Walk-Bike Plan developed by the Hillsborough Metropolitan Planning Organization. The Tampa Walk-Bike Plan identifies several projects in the downtown area, as well as a host of other projects throughout the city, in existing public rights of way. The purpose is to “complete the City’s bicycle and pedestrian grid” by enhancing connectivity and safety for bicyclists and pedestrians. There are two main types of projects identified: “Complete Streets” and Stand-alone projects. The purpose of Complete Streets projects is to better incorporate bicycle, pedestrian, and transit modes by reviewing the possibility of road dieting. 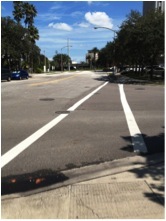 Stand-alone projects are the “low hanging fruit” – and constitute minor adjustments that can be made without changing the existing roadway geometry, often including the construction of sidewalks or modifying pavement markings to designate bicycle lanes. This initiative is a good step in the right direction because it provides a cost-effective way to enhance bicycle and mobility on the interim. The more expensive “Complete Streets” projects will be considered whenever an “arterial, collector, or neighorhood collector roadway is widened or resurfaced” through a multi-governmental coordination process. Similar to other industrial cities, Tampa has historically turned its back on its waterfront. Downtown Tampa is surrounded by water on three sides yet appears to be so disengaged from its geography – most waterfront parcels are privately owned and public spaces and parks face inward. 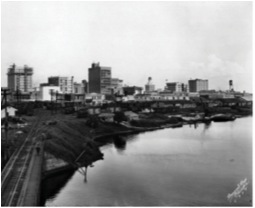 Historically, the Hillsborough River was used to provide transportation and drive the local economy. At the turn of the 20th century, wide channels were dredged to bolster Tampa’s growing shipping industry. A century later and things have changed; industry is mainly moving out of the area and downtown Tampa is reinventing itself as a regional entertainment destination and urban neighborhood. A major initiative to reinvigorate downtown Tampa is the completion of the Riverwalk. With the last few segments of the Tampa Riverwalk underway, the city has been turning its focus to its riverfront. The first discussions about enhancing public access to the waterfront location began in the 1970’s and the first design standards were set in 1989. As several developments came to fruition such as the Straz Center for Performing Arts and the Tampa Convention Center, the first pieces of the Riverwalk’s waterfront promenades were built. Over the years the discussion has continued with new ideas to engage the waterfront. One unique effort has been [re] Stitch TAMPA that is an international design completion that included proposals from designers from around the world, including locally, for how to engage the waterfront and establish urban open spaces. Recently it was announced that the city will receive an $11 million federal grant to finish two smaller, more expensive gaps in The Riverwalk. Once completed it will provide an uninterrupted 2.4-mile connection for pedestrians and bicyclists from the Straz Center for the Performing Arts on the north, to the Channelside district to the southeast, and will include several museums, open spaces, and other landmarks along the way. Another interesting development is the “Zack Street Promenade of the Arts”. 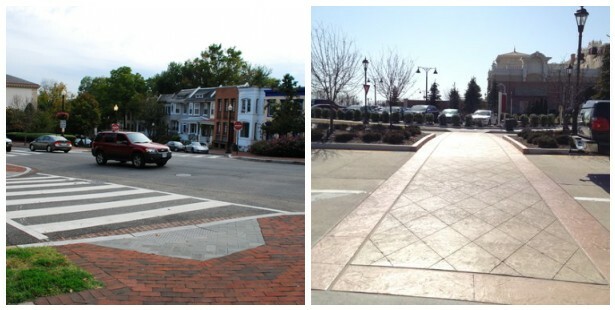 The project reclaimed nearly two full automobile lanes to provide widened sidewalks, improved street crossings, and landscaping for pedestrians with the intent to integrate Public Art into the streetscape. While the Zack Street Promenade has room for improvement, it will serve as a fantastic gateway to the Curtis Hixon Waterfront Park located by the Riverwalk. 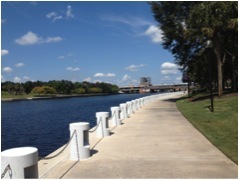 The waterfront park has become the heart of downtown with major events held on a weekly basis. 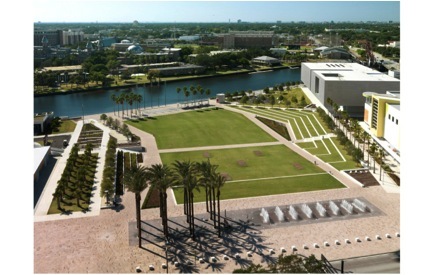 It is also edged by the newly constructed Glazer Children’s Museum and the Tampa Museum of Art. The Promenade will connect the waterfront park to several other cultural amenities such as the Tampa Theatre as well as to an old federal courthouse that has been announced as a future boutique hotel. By connecting to the Curtis Hixon Waterfront Park an important pedestrian connection across Ashley Drive will be provided which is one of the major roadways in and out of downtown that provides a barrier. Visions for redesigning Ashley Drive have been discussed and should continue to be a focus. The high-speed traffic funnelling directly off two interstate ramps does not complement the built environment of downtown, and is a safety hazard for pedestrians and cyclists on a daily basis. While not technically a highway, the road could benefit from many of the principles enlisted in the CNU’s Project for Transportation Reform “Highways to Boulevards” program. While the transportation network in downtown Tampa is still heavily automobile dominated, pedestrian and bicycle activity is increasing. Providing options through pedestrian and bicycle mobility will be important as downtown Tampa continues to grow as a residential and commercial destination. The Project for Transportation Reform’s Designing Walkable Urban Thoroughfares and Transportation Networks initiative has applicability in certain contexts in downtown Tampa. The city has made strides in recent years and should continue to look for ways to build momentum through improving its transportation network where feasible. Jared Schneider is a planner and project manager in Tampa and is currently pursuing a Master of Planning in Civic Urbanism degree from Rollins College in Winter Park, FL. He is also a member of CNU Tampa Bay, which is a local chapter of Congress for the New Urbanism. Tampa City Spotlight: A Transit Past – But is There a Future? In a series of posts part of the Congress for the New Urbanism‘s City Spotlight Series, members of CNU Tampa Bay will examine the current conditions of Tampa, urban trends and the initiatives (or lack thereof) put in place by the city, and how CNU can meet these needs. 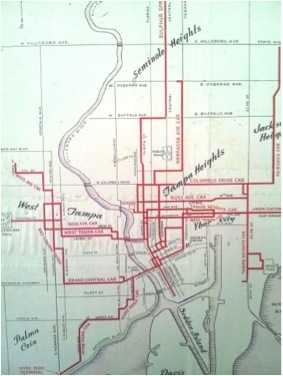 In this second post of the series, Stephen Benson, a transportation planner, will examine Tampa’s transit past and if its holds potential for its rebirth in the future. Creating great urban places relies heavily on providing reliable and efficient mass transit. A pedestrian or cyclist can only get so far on foot or on bike. In this article I will discuss Tampa’s lost love affair with the streetcar, how suburbanization deprived Tampa’s urban core of 60 years of economic growth, and how Tampa’s lack of reliable, efficient transit service has left it a second-tier city. 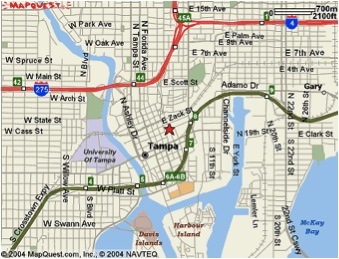 Tampa began as a blue-collar manufacturing town – industrial, urban, and extremely diverse. Unlike nearby St. Petersburg, Tampa was not a vacation haven for rich northerners. It was a testament to the melting pot of cultural diversity and hard work that personifies what it meant to live in early twentieth century America. 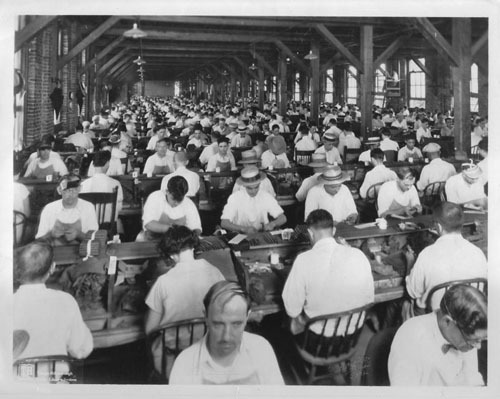 Immigrants from all over the world came here to work in and support the booming cigar industry. My great grandparents came to Tampa from Spain and Cuba to work in factories. My grandparents ran a restaurant that catered to working class cigar rollers. For most of the 20th century, Tampa’s historic Ybor City district was dubbed the Cigar Capital of the World – rolling out millions of cigars every year. This rich history of manufacturing left its physical mark on the city and makes Tampa’s roots unique to most places in Florida, and the world. The rise of the automobile and subsequent conversion to motorized bus systems led to the streetcar’s demise in Tampa, as it did in many other cities throughout the US. 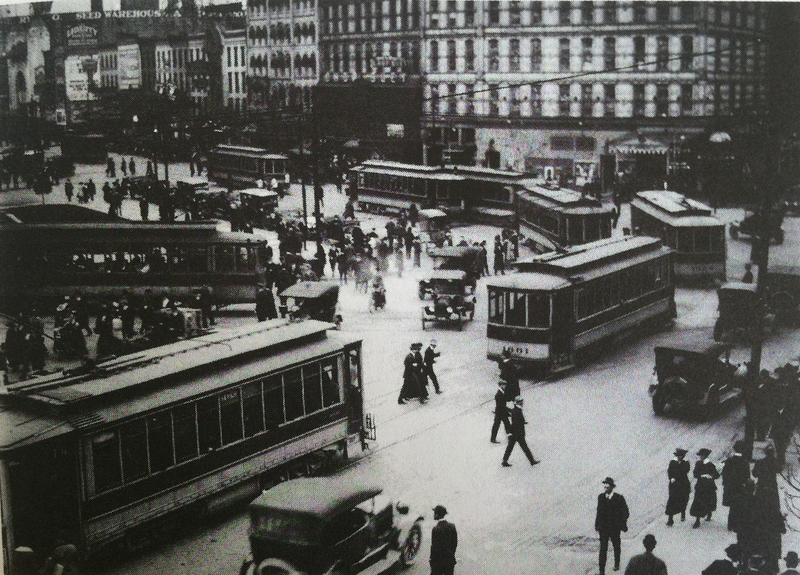 Some historians cite conspiracy on the part of the automobile industry as causing the unpopular transition from streetcar to bus. One by one, the automobile industry gained control of popular streetcar systems and dismantled them, promising more efficient (and profitable) gas-powered bus lines. Suspicious locals complained of bribery, spotting elected officials driving new Cadillacs shortly after voting in favor of the transit system’s conversion. Tampa’s documented history of corruption and mob influence supports this theory. To learn more about why this happened, read Internal Combustion by Edwin Black. 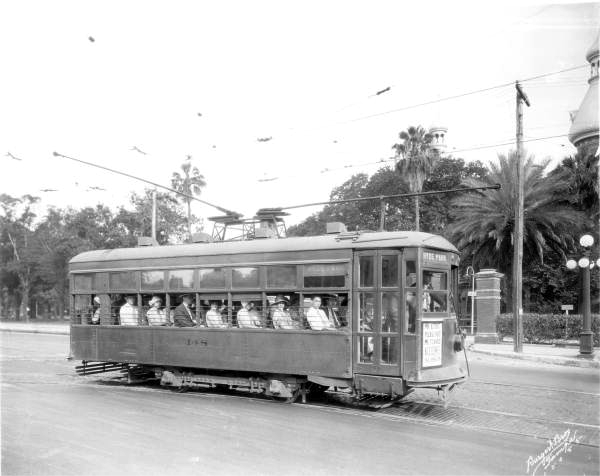 Tampa’s last streetcar ran on August 11, 1946. This began a journey on the path of suburbanization and sprawl that supported growth and industry for many years. Now, it plagues the city’s economy, culture and built environment, as it necessitates the use of a car, which to many is quickly becoming financially burdensome. The modern bus system that eventually replaced the streetcar – today called Hillsborough Area Regional Transit (HART) – has never come close to the streetcar’s peak ridership in 1926 – almost a century and over 4 Million people in growth later. While the merits of the transition from streetcar to bus to automobile can be debated, the impact on the urban form of Tampa and nearly every American city is undeniable. 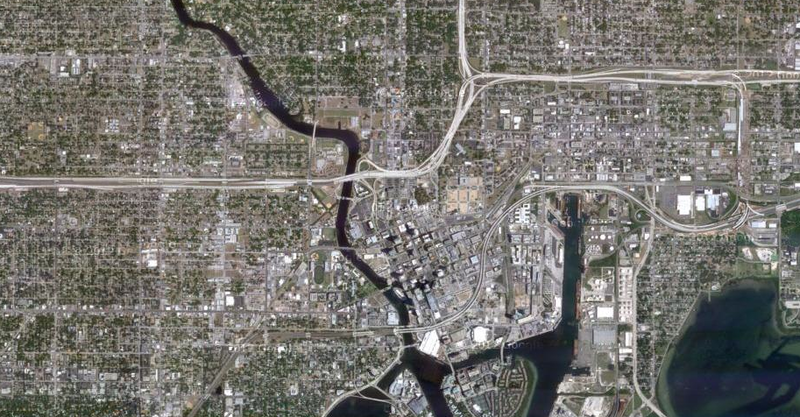 During the second half of the 20th century, Tampa grew outward instead of upward. The popularity of the automobile and the availability of cheap far-flung land led to widespread low-density suburban development, severely diminishing the small-scale urbanism of the historic central city, which fell into blight and disrepair. Urban renewal demolished much of Ybor City, made big promises for urban redevelopment and instead delivered a sea of vacant lots. 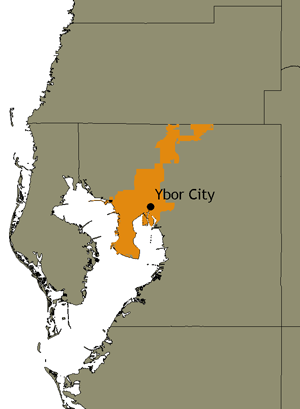 In the 1960s, the interstate highways were expanded through Ybor City and West Tampa, destroying existing communities and disconnecting the urban core even more. Like the rest of the nation, anti-urban sentiments lured residents to suburbs outside of town. As a result, the City of Tampa’s population has seen little growth since the 1960s– only about 20%. In the same time, surrounding unincorporated Hillsborough County has tripled in population and neighboring Pasco County’s population has increased tenfold. In 1988, the City of Tampa annexed 24 square miles located 15 miles to the north of downtown and dubbed it ‘New Tampa.’ Originally, this newly incorporated area was discontinuous from the rest of the city, but the state legislature later passed a requirement mandating municipalities to maintain a contiguous land area. To comply, the City annexed a small strip of land to connect New Tampa with the rest of the city, near the University of South Florida (USF) campus. The image below depicts the current gerrymandered city boundaries. Today, the Census Bureau estimates the population of the Tampa-St. Petersburg-Clearwater Metropolitan Statistical Area at 4.2 million, making it the 17th most populous in the nation and the 15th largest in land area. Yet, it doesn’t even make it into the top 100 for population density. Even with several walkable urban activity centers, the surrounding metro area’s nearly 1,000 square miles of established suburban development is gargantuan. Serving the metro area with efficient transit service is nearly impossible without a staggering financial investment and strong, coordinated political will across the region. Even then, with residents spread so thinly, bus routes would have to criss-cross the county like a tightly-spun spider web. In 2010, a one percent sales tax increase referendum, to fund transportation improvements (including light rail between Downtown Tampa, Tampa International Airport, and the USF campus) in Hillsborough County failed. Abysmally. The reason? A combination of confusion and distrust of government. Generally speaking, most of the major improvements (including light rail) would have been implemented within the City of Tampa limits and the more urban parts of the unincorporated county. But the resounding question among more suburban county residents was “what’s in it for me?” Transportation planners failed to clearly and accurately answer that question to the general public. Sure, you’re building light rail over in Tampa, but what about that nasty pothole on my cul-de-sac? The typical suburban-versus-urban dynamic is alive and well in West Central Florida. Post-referendum reports cite that over 70% of residents think something needs to be done to improve transportation. Where they disagree is what to do to fix it, and how to pay for it. Local leaders have failed to effectively explain that improvements to the overall transportation system don’t only benefit those who regularly use it, but they help grow and support the economy of the entire region, attracting businesses and residents alike. Traffic congestion impacts the entire region, not just the specific neighborhood or road where it occurs. Wasted time and fuel as a result of congestion trickles down to higher costs for goods and services for consumers. Improving regional transportation is a win-win for everyone. Suburban residents can’t rationalize walking a half-mile through winding, indirect subdivisions to get to a bus stop, and wait 30 minutes for a bus to arrive. When they moved in, they never intended to use transit and without any major infill and redevelopment they likely never will. Stephen Benson is a transportation planner and third-generation Tampa native. He is also a member of CNU Tampa Bay, which is a local chapter of Congress for the New Urbanism. Please visit http://groupspaces.com/CNUTampaBay/ and https://www.facebook.com/CNUTampaBay to learn more! In a series of posts part of the Congress for the New Urbanism‘s City Spotlight Series, members of CNU Tampa Bay will examine the current conditions of Tampa, urban trends and the initiatives (or lack thereof) put in place by the city, and how CNU can meet these needs. In this first post, I will examine Tampa’s network and condition of arterial roadways and how they are relevant to CNU’s Project for Transportation Reform. When I moved to Tampa just this year, I was relieved to see that it is a very well connected city. Blocks may vary in size and form, but every urban neighborhood is woven together in a tight grid. The assumption was that the city could be a fertile ground for mixed-use walkable areas. However, I soon learned, despite my urban design training, experience, and education, that connectivity is not everything. In addition to connectivity and a consistent investment in infrastructure, land use development is also crucial to making thoroughfares walkable. 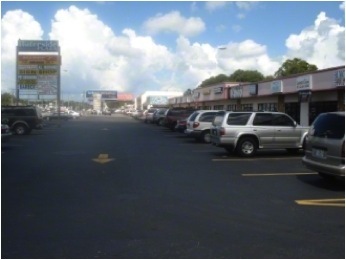 While other connected roads in Tampa are still host to older and historic buildings that once formed small pockets of pedestrian-oriented mixed-uses, most of modern commercial development along the afore mentioned corridors are auto-oriented. 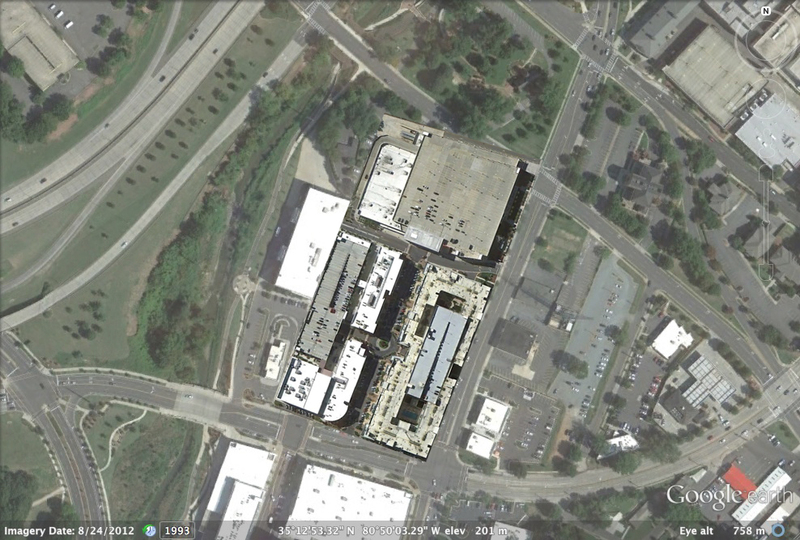 The result is that large surface parking lots line roads with low-density buildings set back far from the sidewalks. Not only does this deprive the corridors of an easily accessible pedestrian network and an in scale building height to street ratio, it makes uses separated at a distance that is unwalkable. Even in the most urban neighborhoods, new development still often follows this form. The lesson learned is that connectivity cannot lead to change alone. Tampa is one of the most connected cities I have ever lived in, but the adherence to Functional Classification and poor land use development, creates corridors inhospitable to pedestrians. How is the city fixing it? Slowly. 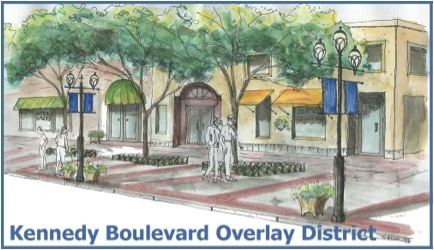 Perhaps the best example is the Kennedy Overlay District project along Kennedy Boulevard, which the city has recognized as a gateway into the city. Carrying traffic from nearby St. Petersburg and Clearwater, as well as Tampa International Airport, Kennedy is a very important corridor to the city. It also plays an enormous role in the social sustainability of the city by connecting a large number of historic neighborhoods together, some healthier than others. The City describes it: “Providing a form-based, aesthetic framework that promotes development that creates a sense of interest and promotes a physically attractive, functionally integrated environment is essential. 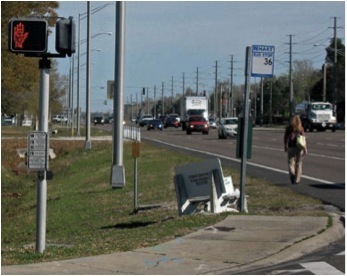 Additionally, provisions are introduced that establish pedestrian and transit friendly design standards for this corridor.” (City of Tampa, 2012.) Essentially, new development requires a private investment in a much wider sidewalk with street trees and most importantly that buildings front the street. The result over time is a multimodal corridor that serves as a spine of sustainability for the city. Progress has moved slowly along the corridor, in part I am sure to the economic downturn. 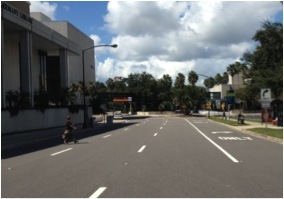 Some successful examples do exist however, that show a much-improved future for Tampa pedestrians. 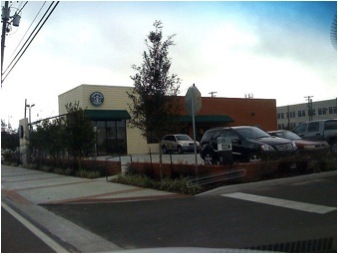 The best example is a Starbucks that provides a widened sidewalk enhanced with brickwork, street trees, outdoor seating against the public realm, a small parking lot to the side of the building instead of in front, and a curb cut entrance on a side street to maintain a consistent streetscape on Kennedy. The difference is very noticeable when compared with the development next to it. With eight similar overlay districts along its corridors, Tampa is making a slowly growing commitment to adopting more urban and sustainable standards. Another project that is improving the use of Tampa corridors by all users is the Hillsborough Metropolitan Planning Organization’s Walk/Bike Plan. In summary, “the Walk‐Bike Plan identifies bicycle and pedestrian mobility projects which can be constructed within existing roadway alignments and other public rights‐of‐way that provide a basic accommodation for walking and bicycle mobility. 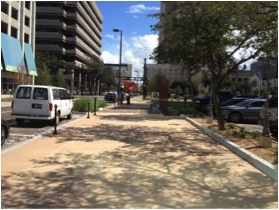 As the plan is implemented, elements such as landscaping/streetscaping and other enhancements may be considered to improve the quality of the cyclist/pedestrian experience and to incentivize private investment within Walk‐Bike Plan project corridors.” (City of Tampa Walk/Bike Plan, 2011.) 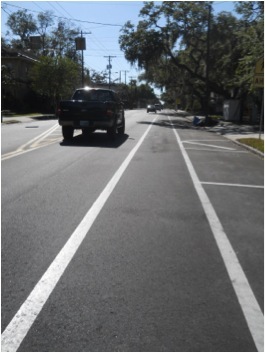 In essence and its implementation to date, as regular maintenance and repaving of roads occur striping is amended to include thinner lanes, on-street parking, and a connected network of bike lanes. This project is admirable because it can make a large difference in a street’s safety and comfortability, without requiring an increase in funds. This is particularly important in today’s economic climate. On streets where restriping has occurred, traffic has slowed and the number of cyclists have increased. However, while these are admirable advances by a city that is cash-strapped in a recession (like many), a much larger shift in theory and commitment in practice are required to make a noticeable difference along Tampa’s corridors. At the recent CNU20 Conference in West Palm Beach, I attended the Mobility and the Walkable City track, which explored many of the issues that face the implementation of walkable thoroughfares. I very impressed with new urbanist, Rick Hall’s adaptation of Functional Classification to New Urbanism’s transect. In his quest to see more complete streets built, he realized that to see change, he must speak the language of the people capable of making change. As a former employee of the DOT, he knew that the Functional Classification System was so imbedded in the U.S. transportation culture that he needed to adapt it to consider land use, contextual character, and multimodal uses. The traditional DOT focus has been on safety = less congestion = moving cars quickly. While the traditional system defines a lot, along with establishing this belief, it doesn’t clearly demarcate the difference between suburban, rural, and urban. In many cases, the system defaults to rural and suburban, resulting in large roads devoid of place. Hall’s new Augmented Functional Classification manipulates the speed and design for the same road type based on the land use context. Instead of a corridor maintaining the same design despite whether it is in the suburban or urban, which occurs constantly in Tampa, Hall’s system suggests that road design change based on the land uses along it. This doesn’t necessarily mean that the street would carry less traffic, but curb/gutter, sidewalk and public realm design, cycling facilities, and crosswalks would adapt throughout the city. The result would be a more walkable street when it was required. While this new urbanist idea requires more research, development and implementation before it can be fairly judged as a solution to the adaptation of Tampa’s many deficient corridors, it is this “big idea” thinking that is required to make an impact for pedestrians and cyclists for my city, and many others in Florida. And while a “big idea” can’t be applied consistently to every corridor in the city, one is required to be a catayst for a large change. 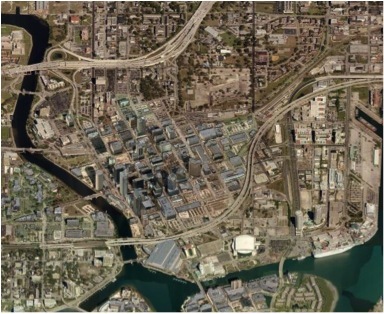 Therefore, Tampa could benefit greatly from adopting a new framework in corridor retrofits. Many roads in Tampa, despite it’s connected grid network, are a mess and pose a huge threat to the mixed-use walkable development that is at the heart of CNU’s Charter and core mission. While the city is making small steps to improve it’s corridors over time, Tampa is a perfect testing ground for the Project for Transportation Reform and big ideas like Rick Hall’s Augmented Classification. In an attempt to dive a little deeper into what urban design is, and how it became the important profession that it is today, I have decided to start an “Urban Designer” series. Periodically, I will look at the most well-known urban design writers, scholars, and professionals throughout history and contemporary society. Some will have created the most influential of design movements, some will have created controversy, some will have answered the challenges created by those, some will answer the most pertinent issues of today. Most importantly with this series, I hope to paint a picture of the vast array of opinions and views of built environment professionals, but highlight the fact that the greatest focus on very similar principles. There are many urban designers that this series could begin with like Kevin Lynch, Gordon Cullen, or Jane Jacobs : many are considered great in our history. However, I am beginning with the man whose urban planning philosophy was the precipice for the modern-day urban design profession. Without him, and the fore mentioned people who responded so passionately to his beliefs, I am not sure that I would have the career I do today. Robert Moses began his career as an urban planner/highway engineer at the exact same time as the automobile was gaining favor and abundancy in America. Many would argue that it is no coincidence that his urban planning philosophy, in turn, was so car oriented. Moses came from a time when driving a car, was just not seen as utilitarian, it was seen as entertainment. As it became common place, planners shifted their focus from the experience of the pedestrian or the community, the experience of the driver. 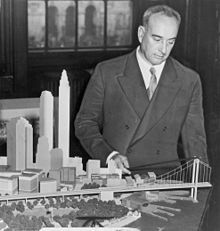 Robert Moses was not alone in his view, he just happened to be perpetuating it in the most high profile city in the world: New York City. Moses was instrumental in the construction of the Triborough, Throgs Neck, Bronx-Whitestone, Henry Hudson, and the Verrazano Narrows bridges, as well as the Brooklyn Battery Tunnel, Brooklyn-Queens Expressway, Staten Island Expressway, the Cross-Bronx Crossway, the Belt Parkway, and Laurelton Parkway, just to name a few. Later in his career, the design of these roads shifted from a well-landscaped and beautified design, to the utilitarian highways we know today. Moses was also a very political man, and had placed himself of a position of great influence. He was the Construction Manager in New York City after WWII and found himself in great favor with mayors and those who funded large construction projects. These bridges and highway systems he had masterminded made lots of money for the city, and in turn, he had power among other planning projects in the city. He also prohibited the creation of a city-wide Comprehensive Zoning Plan already underway, that would prohibited a majority of the visionary projects he had planned for New York City. With policy, funding, and politics in his corner there was little stopping him…New York was his. No doubt influenced by other planners’ philosophy of the time, like Corbusier, Moses favored the eradication of “blight” and the construction of high-rise public housing projects. 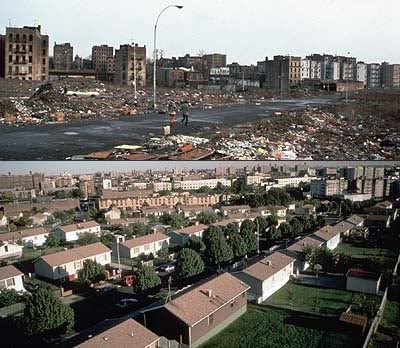 Historic neighborhoods and communities were bulldozed to make way for idealized and controlled housing plan across New York City. At the time these places were considered ghettos by many, and eradication was viewed as an improvement. It’s been reported that unlike other public housing authorities, at least those planned by Moses were high-quality construction. And many of them still stand today. 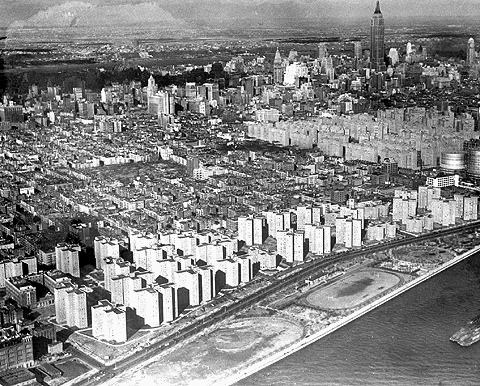 Robert Moses built 28,000 apartments based on Le Corbusier’s “Radiant City” design scheme. 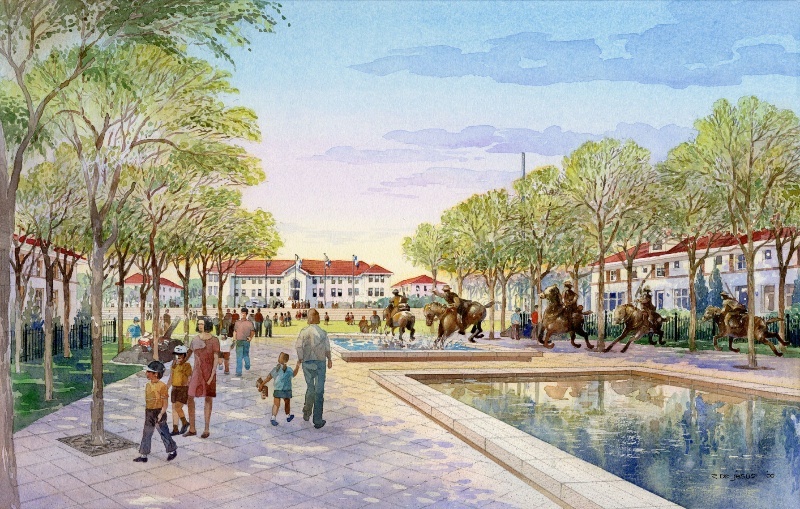 With the separation of people, especially pedestrians, from cars and ground floor activity, an idealized design of the concentration of residents surrounded by green space was favored. If you look at the east side waterfront of Manhattan, the housing projects from 14th street to the Brooklyn Bridge are the result of Moses’ work. Later, after duplicates of Moses’ work popped up all over the country, and led to worse blight than existed in the first place, his philosophy and work was questioned. Many cities today regret and constantly suffer from the social and economic impacts that have resulted from the highway segregation through urban fabric. Unpredicted by Moses, this is just one large negative impact that modernist urban planning had on communities. Moses would later witness that tower public housing led to the worse crime and ghetto conditions that cities had ever seen. Some people have great respect for Robert Moses (many call him the Master Builder,) but if you ask most urban designers about him, they will quickly mention Jane Jacobs. I will write about Jane Jacobs in the next post in this series, but it was her realization of the negativity of Moses’ practices (revolutionary at the time) and her direct and explicit opposition to his projects and political gusto that set the foundation for the urban design profession today. Quite simply, if there were no Robert Moses, there might not be a Jane Jacobs as we know her, and there might not be urban design. Robert Moses was one of the most politically active members of the modernist planning movement, and perhaps implemented more of the ideas than anyone on the ground. And for this reason, he is a famous character in the fruition of urban design. The sacrifice of the pedestrian in favor of the car, and the eradication and segregation of existing communities (no matter how blighted or poor) was a unique urban planning view. Since the car was a new invention, until then planning was based on the most traditional principles: people. This major shift in planning philosophy changed the way people lived everyday of their life because of large changes in their built environment. This new way of thinking was adopted long enough for there to be a large transformation in many of America’s largest cities, including New York City. This questioning of Robert Moses’ beliefs and some of his personal actions led to the end of his era of planning. 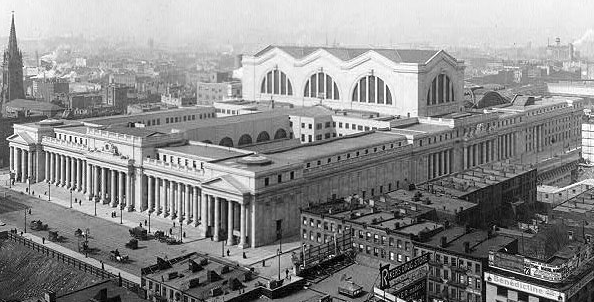 Many would argue it began with his encouragement to demolish the historic Penn Station (a New York landmark) in favor of a much less impressive development. Subsequently, he proposed that Greenwich Village and Soho be eradicated for the construction of a highway. This met so much opposition, it never occurred. Finally, he committed political suicide when he went up against governor, Nelson Rockefeller, who wanted to use toll money from one of Moses’ bridges to fund public transportation. No longer having the mayor’s trust and allegiance, Moses’ project ideas fell on deaf ears. In the late 1970s and early 1980s is when urban design really became a vocation and later evolved into a profession. Before, that term truly wasn’t recognized. There was no need to return to traditional urban planning because it hadn’t been abandoned. Today, most urban designers (or at least everyone I’ve worked with) continue to work against the philosophy of Robert Moses. While most planners realize the destruction his work had on the city, its heritage, and communities, there is still a huge dependence on automobiles that still must be considered in policy making and development every day. Robert Moses does have a positive legacy with his development of Long Island and the New York State Park system. Unfortunately that is often ignored due to the result of the 13 highways in New York City that have resulted in the eradication in the city’s character. There is no doubt, despite his ideas, that he was a huge influence in the creation of the urban design profession, which has been instrumental in sustainable design and development. And for that, we can be grateful for his career. Can Emerging Nations Avoid the US Path? When I visit emerging or even European countries, I am saddened by seeing mistakes on the ground that America has made three decades before. Why can’t we learn from each other? Is it because people and cities are so giddy with new found wealth that they can’t resist the temptations of over-development, sprawl, or car use? I stumbled across this blog entry that attempts to answer this question and thought I’d share. Please enjoy! Since the emergence and rapid spread of car ownership and use in America since the early part of the 20th Century, the United States has taken a large number of ruinous, unsustainable actions to make life happy for cars rather than people. While it is true that car travel initially resulted in many positive improvements in our society, those improvements are now increasingly overwhelmed by negatives, as the continued provision of infrastructure, programs and finances to promote car travel is now experiencing severely diminishing returns that started later on in the 20th Century. We are now at a point that each “improvement” for car travel – an “improvement” that is increasingly unaffordable – provides fewer and fewer benefits. And the costs of such “improvements” provide increasingly enormous decimation. A classic case, in other words, of diminishing returns. What happens when you provide something that everyone wants? When there is a huge demand for something prices are high, and usually markets answer with a large supply. As a result prices lower. Supply and demand…we all learned about it in high school. But in the case of housing along transit lines, in many places across America that demand is never met. With gas prices rising, commutes getting longer, obesity levels increasing, and quality of life deteriorating, the demand for accessible and efficient transit has never been higher. No matter what sector of society you are in, most people add to that demand. However, building high speed rail, light rail, and commuter rail require an oftentimes insurmountable level of funding. So, when rail is built and housing is constructed along it, the cost per unit is through the roof. It is not unusual for rail to traverse deprived parts of town as a result of taking advantage of existing infrastructure and actively trying to revitalize areas most in need. Therefore the result is often gentrification: people who have lived in one neighborhood for years are forced to move because they can no longer afford it. For people in the later years of their life this uprooting can be devastating. Gentrification is arguably the worse effect of urban redevelopment and it certainly has been the most debated for decades. 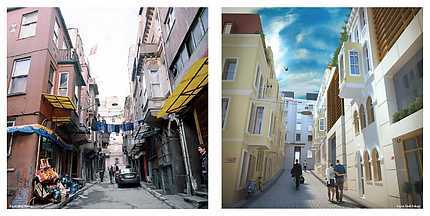 The debate lies in the nobleness of improving the quality of the built environment, which has enormous effects on the economic, environmental, and social sustainability of a city, versus the inevitable result of people being displaced from their homes and neighborhoods after decades of living there, because of the growing unaffordable cost of living. Is there a way to reap the benefits of redevelopment while avoiding the natural effects of the economic markets? The June 2012 issue of Better Cities and Towns, explores how Los Angeles will try to avoid displacement as a result of the “largest transit expansion in the United States.” In the Reconnecting America last month, it was reported that the city will get 42 additional transit stations as a result of the $40 billion ballot measure approved by voters in 2008. LA County will benefit as well. • Acquiring key properties for long-term preservation and development. • Coordinating existing tools that can be used to keep buildings intact and reasonably priced. • Anticipating the behavior of property owners and aiming outreach and enforcement activities at owners and tenants. Is this government overreaching into the market? Are these practices sustainable and effective over time? Will restricting development hinder the spillover effects of regeneration? Doesn’t a larger amount of the population than you are protecting need and deserve access to public transportation? In the Next American City article, “Why We Struggle to Talk About Gentrification,” author Christine McLaren suggests that the unquantifiable result of gentrification makes it impossible to integrate in policy. After all policy is based on provable data, not anecdotal evidence. As a result the conversation of gentrification has become misguided: do we focus on the gentrified or the gentrifiers? Does perception lie in human right issues or social and commercial diversity? Also, like other societal issues that are often oversimplified to one of race, the debate on gentrification is reduced to a black vs. white issue constantly. In another Next American City article, “Gentrification: Not Only About White People,” Matt Bevilacqua focuses the conversation back to socio-economics and reports on stronger ties to education level and weaker ties to race. With the challenge of collecting accurate data and standing against hot topic debate, the gentrification conversation constantly loses its way and is very difficult to control through policy. As an urban designer who has studied gentrification case studies of the past and witnessed it on the ground..I don’t know the answer. And I’m confident no one does. Through our public finance work at Tindale-Oliver & Associates, I come across counties that suffer from a tax-base that has nose-dived as a result of the recession and crumbling infrastructure that they cannot afford to repair, much less expand. Facilities like fire stations, schools, libraries, etc. are burning a hole in local government’s pockets because low densities cannot support them. So I get it, and as a planner, I want to help these places redevelop themselves to be self-sustaining and healthy environments. And perhaps the best catalyst for growth and redevelopment to higher densities is transit. • Require high levels of funding for public involvement to ensure local communities are instrumental in the planning process. • Preserve the physical structures and urban form that contribute to the historical identity of a neighborhood and design sensitively around them. • Incentivize high levels of public and affordable housing as part of the development. Will generation still occur using these tactics, probably. Will it be done more sensitively with the result of preserving it’s identity? Probably. Gentrification is no doubt a hot topic that after decades has appeared to be inevitable, but many projects demonstrate that the level of destruction that it causes can be curbed. As long as we are constantly aware of everyone’s lives we are affecting as planners, including those who might suffer loss as a result of gentrification, we can have a clean conscience while we continue to debate. All eyes will certainly be on LA as they actively try to maintain the current population along the future transit line and 40+ future stations. While they will certainly have the luxury of providing a higher supply, for what is guaranteed to be a high demand, hopefully they can set an example of how policy can control gentrification without controlling the market. Let me introduce to you Stephen Benson. I first met Stephen on my first visit to Tampa while interviewing for my current position. I could tell from his suave style and haircut that he was much more than your typical urban planner…and I was right! Please enjoy the following article on Florida’s pedestrian problem. In recent years, the Sunshine State bore the brunt of national criticism regarding roadway safety due to our alarming record of pedestrian fatalities. While it’s true that we carry the highest pedestrian fatality rate when compared to our population, headlines seem to ignore the fact that this pedestrian safety problem is not unique to Florida. According to the 2011 ‘Dangerous by Design’ report released by Transportation for America, 9 of the top 10 states with the highest pedestrian fatality rates are “Sun Belt” states. The superficial response to this statement is that our beautiful, mild climate is the cause; sunshine and flat terrain promotes recreational demand and increases pedestrian activity. However, while mild climate certainly influences the lifestyles of this region, this conclusion falsely implies that nothing else can be done to improve pedestrian safety. Indeed pedestrian activity is influenced more by culture and the built environment than by the weather. This explains why densely populated northern cities like Seattle, New York, Boston and the District of Columbia have some of the nation’s highest walking, biking, and transit-riding populations, despite their harsh winters and challenging topography. Since pedestrian activity is high, it’s not a surprise that these denser urban centers experience more annual pedestrian fatality counts. But when population is factored into the equation, northern cities fare from low to about average in pedestrian fatality rates, and southern cities and states jump to the top of the list. The real curiosity comes when you consider that even the largest metro areas in the South – Los Angeles, Houston, Phoenix, Atlanta, Miami – are still largely suburban in nature and thus dominated by automobile travelers. This begs the question, how is it that states with relatively low pedestrian activity generate higher pedestrian fatality rates when normalized by population? The answer lies in the built environment and its impact on mobility. The complex pattern is more evident when approached from a macro perspective. 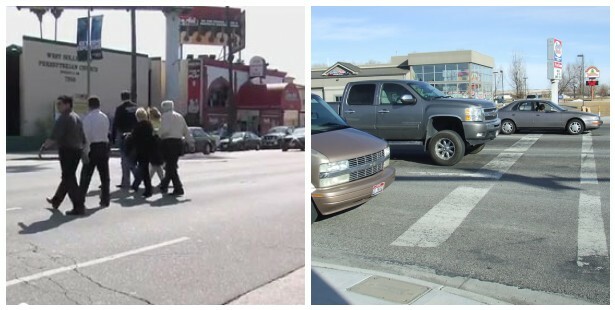 The pedestrian fatality problem can be traced to three primary trends: overwhelming levels of (suburban) growth since the 1960s, large communities of economically disadvantaged citizens with lower educational attainment, and higher proportions of transportation disadvantaged persons (children and the elderly). These land use and socio-economic conditions heavily influence the transportation system – and directly impact pedestrian safety issues. 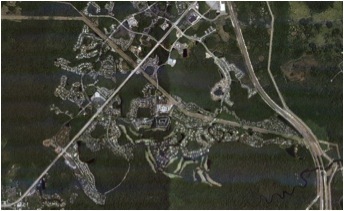 The vast majority of growth in the South since 1960 has been typically suburban in nature – characterized by an intentional separation of land uses and hierarchical street systems with low connectivity and wide 6-lane (or more) arterial roadways. This type of built environment is simply not conducive to pedestrian travel because walking distances are much farther and wide roadways are more challenging for pedestrians to safely cross. Very often, pedestrians choose to cross mid-block simply because it is easier to evaluate fewer automobile movements at once. Major arterial intersections may be built precisely to engineering standards and possess upgraded pedestrian features, but if a pedestrian feels intimidated by an intersection they will choose to cross elsewhere. Suffice it to say that transportation disadvantaged and economically disadvantaged populations – who rely on transit, walking, and bicycling to get around – are often overwhelmingly present in these areas and are forced to use a system that might not have been designed with their mobility in mind. Neighborhood design has a direct impact on pedestrian safety and the overall pedestrian experience. One of the most important factors lies in crossing distances – generally the fewer lanes a pedestrian must cross, the better. With each additional travel lane comes higher auto-travel speeds and a greater crossing distance for a pedestrian. This translates to a higher safety risk. If a protected median is not present to provide a safe place to pause when crossing, pedestrians must evaluate and avoid automobile traffic traveling in both directions – a task that is often impossible to do while crossing one hundred feet of asphalt on a 6-lane (or more) roadway. In the South, these wide suburban roadways are far more common than in the North, and southern suburban development patterns provide fewer alternate routes along safer “side streets” more common in the street grids of northern cities. Most northern metro areas were built out well before 1950, and their built environments are uniquely characterized by denser development patterns – mixed-use zoning and gridded street systems. While at the heart of some southern cities lay pockets of relatively dense street grids, these southern pre-industrial neighborhoods are quite small, and usually house a miniscule proportion of metro populations. Southern metro areas were built out much later in the 20th century – at the height of suburbanization – and are largely characterized by these development patterns. Even in the small dense urban centers of the south, we have worked tirelessly to redesign existing urban transportation infrastructure to meet new suburban roadway design standards – widening to eleven-foot travel lanes, busting curbs to increase turning radii at intersections, installing continuous right-turn lanes, etc. Only recently have transportation professionals begun to consider “context sensitive” roadway design solutions and develop standards for implementation. According to a 2010 report released by Brookings on ‘Suburban Poverty,’ over the last decade poor populations in major American metropolitan areas increased by nearly 6 million and the vast majority of that growth occurred in suburban areas. Furthermore, over the last few years the metro areas with the highest increases in poverty rates were “Sun Belt” cities throughout Florida and California. It’s no coincidence that Florida and California are also the top two states for pedestrian fatality rates. Indeed pedestrian safety is not only a transportation problem, but a fundamental social justice issue. The passing of the American’s with Disabilities Act adopted national standards for pedestrian mobility in the name of civil rights. It is our responsibility as planners to recognize the significance of pedestrian mobility and safety in our daily work. The long-term solution lies in the way we plan, design and redesign the built environment. This calls for a reevaluation of fundamental land use and transportation principles that have guided development patterns for the last half-century. Indeed, denser mixed-use areas with smaller roadways and more street connectivity have societal benefits from many perspectives – public health, urban design, public utilities and services, and affordable housing. But, these places also tend to be safer for pedestrians. Ensuring that new development follows these pedestrian-friendly guidelines will be the challenge of the future. The short-term solution to pedestrian safety requires a holistic approach that reaches across many professions and disciplines. The first step begins in identifying the top five corridors in your area that carry the most severe-injury pedestrian crashes and fatalities. The challenge is then to implement aggressive educational outreach, law enforcement activities and innovative engineering strategies to reduce pedestrian crashes based on the individual crash patterns on these corridors. Every community has unique safety challenges and a sustained, coordinated multidisciplinary approach is the best strategy to solve these problems. However, nearly every community has a handful of roadways that combined carry the majority of the pedestrian crashes. Focus on making the largest impact on these corridors. Florida’s pedestrian safety problem is not simply another statistic to lament over, or a problem for “the engineers” to fix, and it’s certainly not a side-effect of too much sunshine. As planners, we are guided by the AICP Code of Ethics: “We shall seek social justice by working to expand choice and opportunity for all persons, recognizing a special responsibility to plan for the needs of the disadvantaged and to promote racial and economic integration. We shall urge the alteration of policies, institutions, and decisions that oppose such needs.” Addressing pedestrian safety should serve as another opportunity for us to promote building better communities that truly serve everyone. It is not simply our job to plan for the needs of society, but it is our duty to take action, be proactive, and do everything within our ability to ensure these needs are fulfilled. This article was originally printed in the Winter 2012 issue of Florida Planning Magazine, published by the Florida Chapter of the American Planning Association. Stephen is a transportation planner for Tindale-Oliver & Associates in Tampa, Florida. He holds a BA in Geography and a master’s degree in Urban & Regional Planning from the University of South Florida. His expertise includes transportation safety and planning for bicyclists and pedestrians. He is currently interested in examining the relationship between transportation safety and land use patterns, and identifying coordinated multidisciplinary strategies to mitigate the consequences of urban sprawl. Clearer Thinking: Urbanism + Transit. Jarrett Walker, author of Human Transit: How Clearer Thinking About Public Transit Can Enrich Our Communities and Our Lives, told us he was at CNU20 to preach a little fire and brimstone: transportation planner to new urbanist. While I wouldn’t call it brimstone, he definitely spoke passionately about real issues that need to be considered in enriching people’s lives. While I certainly subscribe to most New Urbanist principles, and am a card-carrying member of the Congress for the New Urbanism, I appreciated Walker’s candid challenge of the art behind the movement. He began his lecture by saying, “You know all those little people you draw in pastel and watercolor? Well, they are citizens of society, not going where you think they will, but where they want to.” That was a straight shot on the idealistic “if you build it, they will come” mentality that exists among some members of the CNU. Him, you, me…all of us…want to feel in control and active in how we navigate our built environment. One of the great things about the New Urbanism movement is that its principles are very relevant to many sectors of the built environment and has, therefore, welcomed members with many different views and beliefs. From his delivery, I don’t think Jarrett Walker would call himself a new urbanist, but he and I share the same priorities on transit. Transit Is Not What It Used to Be About – Transit is not about the work trip, the relief of congestion, or brief interventions. Transit is now relevant to all trips, all purposes, and community building. Distance Matters Differently Between Users – Different users are willing to travel different distances using transit before they resort to their automobile. The most connections should be made within 600 feet. Past that, users drop off quickly (between 1/4 mile and a 1/2 mile riders drop by 50%) so placing retail and office uses within this distance is most important. The Land Use Gap – Built environment professionals are responsible for designing transit-ready neighborhoods based around connected and complete streets. Other built environment professions are responsible for planning the transit system. The gap is that there is no one responsible for merging the two together. 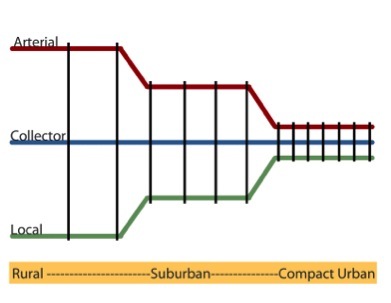 Lifecycles in Planning – The planning cycle for transit oriented development and the planning cycle for a rail system can have a difference of a decade, which is longer than a typical market cycle. Mode Is Not As Important as You Think – Let the land use/corridor determine the mode. What matters much more is the location, market, and frequency of service. Built upon this foundation was Walker’s argument: abundancy = efficiency. What matters is lots of service going where you need it to go and the ability for users to be spontaneous in their use of the system. This is the benefit of the car and it is required of our public transportation system to compete. That is the first and most important requirement in making transit a viable alternative in America. Walker said that the goal of abundant transit requires thinking about how transit can be useful to many kind of trips, not just a few specialized movements such as downtown commutes or senior citizen needs. Instead, we need to design services that are useful to many different people at once. Moving bus stops further apart, for example, imposes some inconvenience on some seniors but dramatically improves the usefulness of service for the city as a whole, by increasing its speed. Secondly, Walker suggests that New Urbanism is really hung up on rail as the only way to support transit oriented development (TOD), but that where rail’s capacity (passengers/driver) is not required, the most efficient mode of transportation is the bus. Perhaps the reason for the obsession with rail is that the alternative is identified with a huge social stigma in the U.S. Issues of race and poverty overshadow the bus system. We have to change this stigma to be able to use effectively our most abundant and, therefore, efficient mode of transit. Thirdly, we must combine our modes seamlessly in order to achieve the optimal amount of efficiency. Walker told the story of his experience of using public transit in Germany. When he arrived at the train station in Heidelberg, he was told he needed to take the 32. He found the appropriate platform, which was beside a set of tracks. He expected a streetcar to arrive, but instead a bus pulled over the tracks. He then transferred to a streetcar, where he could not distinguish between the inside of the two. A perfect and seamless integration of the modes meant that it didn’t matter if you were on a bus, streetcar, train, etc. They were all getting you where you needed to go. Most importantly, Walker makes the point that transit needs to become more transparent, efficient, and functional so that people can take responsibility for where and how they live. He has developed a software tool that shows from any location in Portland where you can get within a certain amount of time on transit systems. The results are blobs on a map in varying degrees of hues, representing periods of time. Not surprisingly, the blobs are bigger and darker the closer the location to the city center. Reproduced for the entire country and made accessible to all, similar to the effect of providing nutrition facts on food packaging, people will be able to make responsible transit decisions that will give them greater control of their mobility. These achievements in transit will allow people to live freely, abundantly, and spontaneously, which in turn will enrich our lives and our communities. While I believe there is value in making transit use enjoyable, pleasant, comfortable, and even fun, I believe more strongly in Walker’s opinion that more than the “color of our seats,” we care about getting where we want to go faster. This post can also be found at Tindale-Oliver & Associates. Erin Chantry is an Urban Designer in the Urban Design and Community Planning Service Team with Tindale-Oliver & Associates. With a BA in Architecture, an MA in Urban Design, and an MSc in Urban Planning, Erin has served on a variety of projects for both public sector and private sector clients, with a primary focus on architecture, urban design, land use planning, design research, and sustainability. She has expert knowledge in New Urbanism, LEED for Neighborhood Development, and how sustainable city planning and urban design can be used as a catalyst for redevelopment. Building a Culture of Bike Safety. In my career I’ve spent so much time thinking about cars, that I’ve overlooked the bicycle…until now. After joining Tindale-Oliver & Associates as an urban designer this year I’ve become involved in the Multimodal Transportation Planning Team that designs bicycle and pedestrian master plans. It has been enlightening to understand the technical and data analysis that is required to make sure cyclists can get where they need to go safely. There are many factors to consider, including facilities, context-sensitivity, implementation, funding, and regional and local policies. It is a much more complicated process than you would expect. Simultaneously, I have been settling into my life in Florida and have found myself for the first time using a bicycle as a form of transportation instead of a form of leisure activity. When I made this shift, my requirements and expectations as a cyclist completely changed. I have felt empowered to have been given the opportunity in certain parts of my city to be able to ride my bike from one destination to the other while feeling safe doing it. However, despite my increased interest in cycling, and my awareness of the detailed planning behind it, there is one gap that I believe still exists in bike planning, at least in Florida: actual safety vs. perceived safety. This was an issue touched upon some at the CNU20 conference in sessions like “From Balanced Roads to TOD” and “Beyond the Bike Lanes: Building a Culture of Bike Safety,” but I felt it was not covered quite enough. The concept of perceived safety vs. actual safety is a concept that filters through all layers of urban design. Similarly, pedestrians might be actually safe walking along a city street alongside lifeless buildings with blank walls. But they probably won’t feel safe because people need other people in close proximity when they are in a public space to feel comfortable. Therefore they won’t walk there. Similarly, while I might be actually safe riding my bike down a collector road in my neighborhood since I have a dedicated bike lane and two 10′ lanes of traffic, I do not feel safe. Therefore, I do not ride. As it turns out, I am not unique. While cycling has become a big grass-roots movement through organizations like Pro Walk/ Pro Bike and The National Center for Bicycling and Walking, and is becoming a more expected form of transportation, there is an enormous gender gap among users. Nearly all the new riders on the U.S. roads in the last 20 years have been men between the ages of 25 and 64. Considering the demographics of U.S. citizens, that is a relatively small constituency that we are currently designing our streets for. So for all the investment made in making our streets more “complete,” how can we do this in a way that reaches out to more users? A 2009 article in Scientific American states that there are two reasons for the gender gap: 1) women are more averse to risk than men, and 2) cycling to work will impede on women’s ability to conform to social norms, including makeup, hair, and hairstyles. The second reason is a big bite to chew, so let me concentrate on the first. I will say, however, that there are lots of ponytail wearing women (like me), who would hop on a bike if they felt safe. Jan Garrard, a senior lecturer in planning states, “If you want to know if an urban environment supports cycling, you can forget about all the detailed ‘bikeability indexes’—just measure the proportion of cyclists who are female.” I personally can’t remember the last time or if I’ve ever seen a woman on a bicycle on the Tampa streets. The first step is to substantially lower the risk of cycling, which will be done mostly through a change in infrastructure. Cycle tracks like the above example in New York City are becoming more popular in certain cities across the country. Because of the complete physical separation from the threat of cars, all users will perceive a lower threat to their safety. The problem besides the constant challenge of funding, is finding the right-of-way to accommodate them, especially in a car-centric culture like Florida. There will have to be evidence of a high enough level of ridership to justify cutting out a lane from a congested street. What we have is a chicken and the egg conundrum: there is not the required ridership now because a majority of 50% of the population doesn’t feel safe. A good compromise to this is allowing room for a physical separation between a one way bike lane and car traffic. Creative medians and plantings used in Denver is one example of this, and simply placing parallel parking between car traffic and the bike lane is another. (See photos below) And then, of course, there is the hope that as towns and cities go on the increasingly popular “road diets,” that they will provide scope for these facilities in addition to placemaking and pedestrian elements. With the right-of-way space to spare, hopefully these can serve as good evidential examples for more congested cities that are hesitant to turn that car lane over. Many might say that building a bike culture is more than just infrastructure. And they would be right. But Billy Hattaway from the Florida DOT said to me this past week that infrastructure is an integral piece, and if we don’t improve bike lanes to cater to a larger part of the population, we might lose the justification to have bike lanes at all. I agree with him. The second step is to get more riders. In “Beyond the Bike Lanes: Building a Culture of Bike Safety,” with Wesley Marshall from the University of Colorado, he showed that evidence proves that the more cyclists there are, the more safe it is to bike. There is a belief by some transportation planning engineers that more cyclists and users in the road will make it unsafe, but “safety in numbers” is true. This is for a couple of reasons: 1) people feel more comfortable doing an activity that they see other people doing, and 2) drivers are more aware of cyclists since they see them more often, in other words, they are on the lookout for them. Of course, infrastructure supportive of biking culture will play a part in this, but Marshall argues what’s even more important are land use patterns. This takes us to the third step. Land use is instrumental in making cycling or walking a viable and efficient transportation choice for users. First of all, people will only choose cycling as a mode of transportation if it is convenient and efficient. Ridership in parts of the city without mixed-uses and with low density will be low compared to more urban areas with many commercial/residential/institutional uses nearby and close together. Riding to a local grocery store to get a gallon of milk is realistic. Riding to a Wal-Mart for your weekly shopping is not. But Marshall’s research showed that the biggest aspect of achieving bike safety is the intersection density. The more intersections there were in a development, the safer it was for riders. At first thought this might go against common sense because intersections are the sites of many crashes, but more connectivity = slower speeds = more awareness. Connectivity also allows for more mixed-uses and higher densities. Many cities put their resources into developing recreational cycling trails. While this is very admirable, as a “wanna-be” cyclist, I’d be a proponent of putting those funds into street design instead. Putting the infrastructure on routes where people go in their everyday lives, will lead to the most increase in ridership. And the fourth step, although, I happen to think it’s the least important, is encouraging people to cycle by making it a pleasant experience. I mention this only because William Lindeke, a PhD candidate at the University of Minnesota, summarized his research quickly in the session “From Balanced Roads to TOD” as part of the CNU20 conference. When he interviewed regular cyclists about their favorite thing about choosing cycling as a form of transportation, their responses were: “I like to see how long I can go without holding the handlebars” and “I love the sound of my tires crunching acorns beneath my tires.” I will add to that by saying my favorite thing about riding my bike down Bayshore Blvd. is feeling the wind hit my face when it’s hot outside. Many people ride for many different reasons. This research is definitely worth being aware of when planners design cycling infrastructure. So there are a lot of factors that need to come together to increase ridership and bridge the gender gap in cycling. As someone who would love to ditch my car in favor of my bike on my daily commute, the risk aversion holds me back. I think Billy Hattaway’s warning is very relevant in the future of bike/ped planning. Providing the lane along the side of the road is not enough: we must examine the evidence and psychology behind riding in order to make it a real choice for the majority of the population or we will find ourselves losing the justification to provide them at all. This article can also be found at Tindale-Oliver & Associates. Functional Classification to Realizing Complete Streets for Everyone. This was John Moore’s question to the audience this past week at CNU 20 during the presentation he entitled, “Not Your Grandfather’s DOT,” as part of the Balanced Roads to Transit-Oriented Development session. His question to the audience was humorous because traffic engineers have gained the reputation in the past as being insensitive and unaware to the many street design qualities required by the CNU Charter and the Complete Streets movement. Moore from District 5 of the Florida Department of Transportation wasn’t the only one creating buzz about how the DOT is moving forward to complete streets. Billy Hattaway, the Secretary of District 1, was also present at CNU20, speaking about the Transit Oriented Development (TND) Chapter in the Roadway Design Green Book that goes live today. Hattaway’s continual presence at CNU and Moore’s presentation show that there is a shift that is beginning to occur within the transportation engineering community. Moore began by laying out the four challenging issues that the DOT is increasingly facing and are creating a new challenge in Florida and the United States. These are acting as the foundation for the direction in which the DOT is shifting its policies. A diminishing reserve of funding and a decrease in revenues shows DOT that its current operation plan is not sustainable. Low densities often equal low tax revenues, which don’t meet the demands of maintaining infrastructure and public facilities. Affecting them even more is the reductions in gas tax due to the decrease in VMT as gas prices have risen, as well as the amended CAFÉ standards and the influx of hybrid vehicles that have improved fuel economy. There is a consensus that this unsustainable trajectory needs to shift. It was refreshing and encouraging to have such committed representatives from the DOT in attendance at CNU20. I am an urban designer at Tindale-Oliver & Associates in Tampa that has traditionally been known for its transportation planning and engineering practice. As a member of the newly formed Urban Design and Community Planning team, it is my team’s responsibility to integrate land use planning and design into the many projects we do. It has been a wonderful learning experience so far, and with the commitment of my firm and people like Moore and Hattaway at the DOT, I see an encouraging future of change in how we design and build our streets. To quote John, “Move people, not cars.” It’s going to be really exciting to be at the lead of that shift and incrementally change how Florida and the rest of the country address the four issues above. While John Moore did a nice job spelling out the challenges that the DOT faces in realizing its commitment to complete streets, Richard Hall’s presentation as part of the Functional Classification: The Least Interesting Policy that Dominates Most Everything session offered a realistic solution that I believe can have a great impact on getting DOTs there faster. First and foremost, Hall was just funny. At the beginning of what potentially could have been the most boring discussion in CNU history, he demonstrated the irony of the land use world we live in. We give our suburbs names like “Town and Country Estates.” Well is it a town or is the country? Hall suggested it might be Middle Earth. He also defined “street” and “road.” Many use these terms interchangeably when really they are very different. A street is a place that fosters community activity and relationships with people. They are important elements for the social and economic health of the public realm. Roads, on the other hand, are primarily for moving people and cars quickly and provide access to get places. Take the phrases “A product is hitting the street” and “Hit the road, Jack.” You would never exchange the two terms in these phrases. They would lose their meanings, because they are not the same. This is certainly a humorous and easy way to define the two. Read more about the difference between roads and streets here. Hall was involved in the development of Seaside and has committed to New Urbanism ever since. In his quest to see more complete streets built, he realized, just like the master planner, Andres Duany, that in order to see change, he must speak the language of the people capable of making change. Enter the DOT. As a former employee, he knew that the Functional Classification System was so imbedded in the U.S. transportation culture that he needed to adapt it to consider land use, contextual character, and multimodal uses. In addition to his Walkability Index, which can be seen here, he designs roads and streets based on Augmented Functional Classification. Traditionally, arterials, collectors, and local roads are defined by certain characteristics of speed and right-of-way despite the changes in urban context that they are in. The traditional DOT focus has been on safety = less congestion = moving cars quickly. While the traditional system defines a lot, along with establishing this belief, it doesn’t clearly demarcate the difference between suburban, rural, and urban. In many cases, the system defaults to rural and suburban, resulting in large roads devoid of place. Hall’s new system manipulates the speed and design for the same road type based on the context. This system can also serve as a guide in block size and connectivity based on the graphic below. It’s going to take creative conceptual thinking by consultants to work within the transportation planning culture that is rooted deep in engineering. Hall’s innovative reconfiguration of the Functional Classification system is an example of how all transportation planners can approach a more open DOT culture. There is no doubt that even if it is small, there is a shift in engineering culture within the public and private sectors to change the way we design our roads. The change will be slow, but with the help of good urban designers who understand the art of placemaking and the constraints of transportation engineering, we can make change happen faster. Why Did We Stop Walking and How Do We Start Again? As you may know, the CNU20 conference was organized around tracks which allowed you to focus on your particular interest and how it related to New Urbanism. I spent most of my time on the “Mobility and Walkable City” since that is where my concentration lies. There is no doubt that the best breakout session of this track was “Why Did We Stop Walking & How Do We Start Again? The Dawn of the Motor Age in the American City” presented by Eric Dumbaugh, Richard Hall, and Peter Norton. I came into this session with a heightened awareness of this topic after concentrating on Tom Vanderbilt’s series, The Crisis in American Walking in Slate magazine last month. I wasn’t expecting to learn much more. I mean, what was there to learn? We started building our streets around the car because more people started driving, right? I couldn’t have been more wrong. As it turns out there was a blatant social, economic, and political shift that taught us to change the way we used our streets. This was not a natural change in priorities, but a direct result of media propaganda. Now, we always hear that we can’t blame our problems on our past. Our choices are ours alone. If we choose to get into our automobile and drive to the grocery store instead of walk this afternoon, its our own responsibility. Yes, there is truth in that. But just as we might discover in a personal therapy session that there are reasons we make the choices we do in our every day lives, this session enlightened me into why Americans behave the way they do. I encourage you all to read Fighting Traffic by Peter Norton to get all the gory details, but for me the brainwashing media campaign that two generations before me suffered, culminated in the TV show Merrily We Roll Along, narrated by Groucho Marx, as part of the weekly series DuPont Series of the Week, in 1961. While the campaign against the pedestrian started forty years prior, it was this show that coined the phrase “American’s love affair with the automobile.” In it, Groucho Marx narrated that we love our cars and would do anything for them. Essentially, we can’t help any destruction or negative impacts they leave in their wake because we love them too much. The analogy was made between cars and women, i.e. “we can’t live with them, we can’t live without them.” Man was the driver, the car was the woman. Americans were helplessly in love. And what a surprise! Pierre DuPont had a controlling stock in GM (General Motors) from 1914 to 1957 (until he was forced to sell to keep from monopolizing the market as part of the Clayton Antitrust Act), was the GM board chairman for a significant amount of time, and was appointed president of GM in 1920. Americans didn’t decide they had a love affair with the automobile, the DuPont family and Groucho Marx did, and we have believed it ever since. I think it’s important to mention here that while Americans did need convincing to give their streets up to the automobile, they were simultaneously driving more themselves. As the car became more financially accessible and the streetcar was put out of business (by the automobile), it was perhaps easier to understand the messages that the industry was feeding them. After all, the growing number of drivers didn’t want to be blamed for the death of children. It was much easier to blame their parents for letting them play in the street. It is true that the car was empowering and expressive: it could take you wherever you wanted to go, when you wanted to go, and however you wanted to go. Pierre DuPont and Groucho Marx might have had an audience waiting on them, but there is no doubt that without the media campaign they might have not gone so willingly or blindly into the destruction that the automobile caused. We all know the destruction that the automobile has caused in our relationships with community and the environment, but the media shift to loving the automobile is still very much alive today. 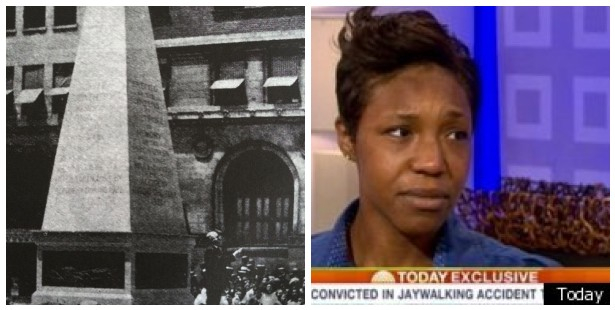 I wrote about the Raquel Nelson case last month (read it here). In case you are not familiar, this woman was charged for the death of her own son when he was struck by a drunk driver crossing a busy arterial in Marietta, Georgia. This was not the first time this has happened. Peter Norton made the case that streets now belong to the car, and anyone that gets in the way of the car is at fault. His point was made clear when he presented data collected by transportation departments in monitoring safety. The data list the reasons for pedestrian deaths in a manner that inherently blames the pedestrian, ie: “death due to disability.” As if this person could control the fact that they were disabled. While many people think that this is absurd, the shift back to streets belonging to people has simply not happened. The AASHTO guide clearly equates higher car speed with safety. Higher speed = street design for the automobile = life threatening conditions for anyone else trying to use the street. Holy cow, knowing this made me so sad. It would be one thing if the destruction we had caused to our built environment was a natural progression of ignorant behavior, but it was due in large part from the manipulations of the corporate media. Heartbreaking. It makes me feel helpless, because it shows how easily our human nature is swayed. GM held our hands into what could be argued as one of the most destructive relationships of the 20th century: man and car. Who knows what long-term destruction will be caused by the manipulation of the media today. But then Eric Dumbaugh made a very opportunistic thought: this media campaign worked once, it can work again. We were so easily influenced to believe that the death of our children was worth our “love affair” with the car. This is evidence that convincing people of anything is possible. Of course behind the media campaign of the first half of the 20th century was a multi-million dollar industry. Just like the tobacco industry that followed in its footsteps, its influence was motivated by profit, not the betterment of mankind. So this is our challenge: who will take the lead this extremely expensive media campaign when the government is has just pumped $27 billion dollars into GM? Eric Dumbaugh also made the point that we need to know our past to understand our future. All built environment professionals need to read Fighting Traffic to fully understand how to move forward in reclaiming our streets. Thanks to Peter Norton for his extremely enlightening research into why we are the way we are today. So much has been explained, the enlightening result will help move forward to building streets where our children can play again. Space, The First But Not Final Frontier: Analyzing Space, Uses, and Transportation. When I chose this breakout session, I didn’t really fully understand the title, but I was confident that with “space” and “transportation,” it had to be up my alley. It turned out to be a presentation of four of the latest and greatest research papers conducted in the New Urbanism field. As they were discussed, it was a little challenging to string them together with one theme, but when the question and answer session started, it became very clear to me very quickly. This was a discussion on connectivity—more specifically, how connectivity was dependent on the clear distinction between public and private space. The two most interesting papers presented were New Urbanism Transportation in an AASHTO World by Wesley Marshall and the Legal Aspect of City Planning and Urban Design by Paul Knight. The former concentrated specifically on the street design of Stapleton in Denver, Colorado, while the latter focused on the extinct Master Street Plan that used to be instrumental in our planning culture. Between the two, a problem was clearly identified and the challenge to overcome it was set in motion. Moderator Elizabeth Plater-Zyberk summed it up nicely when she said that the most crucial element in the development of greenfield land or in urban infill is the clear distinction between private and public space. Without it, true connectivity with the surrounding urban context is impossible. Ever since I became an urban designer, I have been a champion of connectivity. I also have been aware of the importance and benefits of clear separation between public and private space. Perimeter blocks creating the clear separation allows for overlooking opportunities and a safe public realm. They also create the highest concentration of activity in open spaces, which contributes to placemaking and identity-building initiatives. Finally, the distinction of public and private space leads people to better maintain and emotionally connect to their property. But never had I made the association between public vs. private space and connectivity. This is most likely because my urban design and urban planning education took place in England. While this provided a unique and challenging educational context that I cherish, I can be a little foggy on my American planning history. I got a phenomenal history lesson in the Zoning Enabling Act of 1924, which was a zoning plan of private space, and the City Planning Act, which was a master street plan of public space. I learned that in the early 20th century both of these worked together to create a holistic planning system that focused on the separation of public and private space. A 1947 Supreme Court case led to the eradication of the Master Street Plan, which reduced the zoning plan to a comprehensive plan, which acted as a land use map for both public and private space. Let the chaos ensue. The result was that the private sector, not the government, became responsible for building streets … and we actually trusted them to do so. 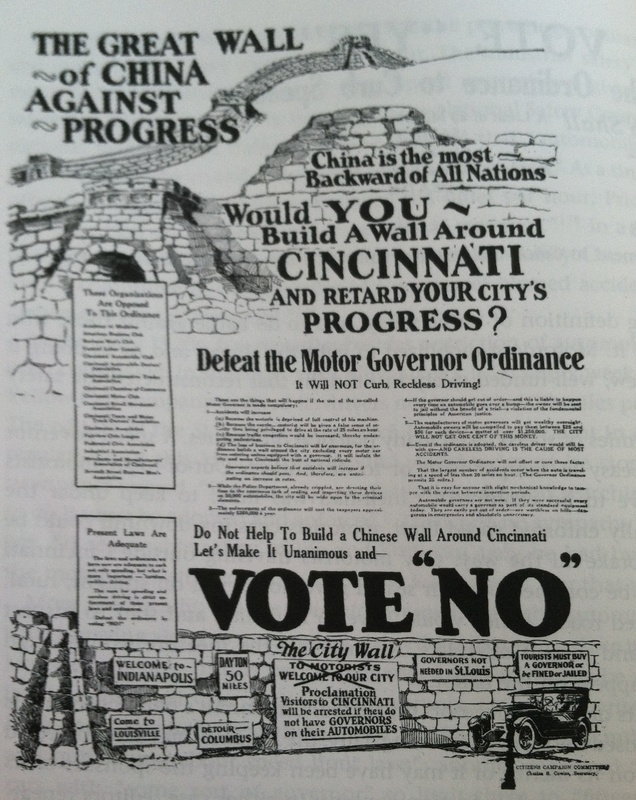 Prior to the eradication of the Master Street Plan, developers, planners, city officials, and the public knew where the public rights-of-way would be, providing a seamless integration of phased development. 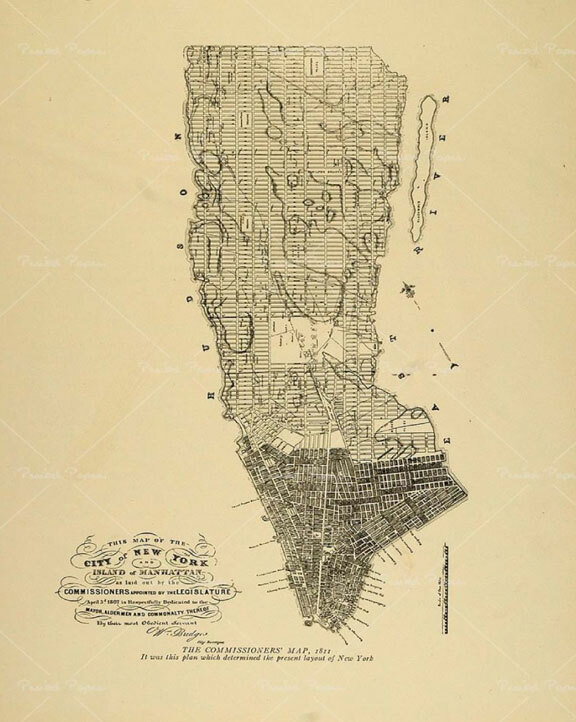 Paul Knight gave the example of Manhattan, which was built over 130 years, but appears to be constructed all at once because, aside from Central Park, it adheres religiously to the street master plan. With the loss of this organization, there is no incentive for the road network to be consistent. Along with many flawed aspects of street design in New Urbanism developments due to satisfying AASHTO demands, the main takeaway from Wesley Marshall’s discussion on Stapleton was that the lack of a Street Master Plan results in “lollypop connectivity.” On a site that will eventually accommodate 30,000 people, there is only one east/west, north/south axis that connects it to the rest of the city. The rest of the grid stems off of these arteries. 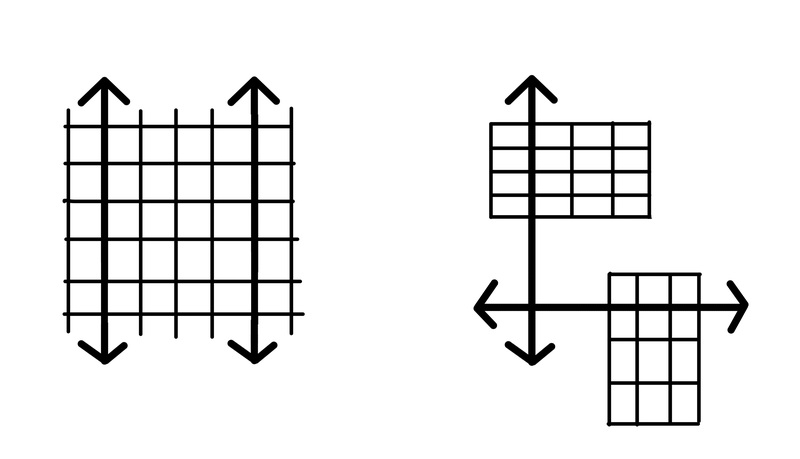 While the interior grid is connected in itself, its lack of contextual connectivity results in arteries that are sometimes six travel lanes wide with a lack of development on either side. The result is an uncomfortable and perceived unsafe place to be. “Lollypop connectivity” is the direct evidence of the challenges that urban designers face in retrofitting suburbia or sprawl repair: zoning had led to a jumble of private and public space with few options to change it. The cost for city government to buy private land in order to connect the road network/alleviate congestion/narrow roads is so high it is unrealistic. While Elizabeth Plater-Zyberk’s reaction to the conundrum that this has left us in today was heavily on the hopeless side, she did offer the example of Miami 21, the zoning code written by DPZ. While they were very, very close to convincing the Public Works department to allow street design and construction to go to public hearing, they did not succeed. DPZ was able to ensure a one-mile grid requirement within the Miami city limits. If this were in place in Denver when Stapleton was built, there is no doubt that the development would operate and appear radically different. Repairing sprawl has increasingly become a popular topic within New Urbanism circles, and there is no doubt that it is one of the most important tasks for my generation of urban designers. Plater-Zyberk says the most powerful thing we can do is create that division between public and private space. This was a strong and effective realization for me in my fight for connectivity. These two powerful pieces of research presented by academics and professionals in their 20s demonstrate that with a little help from our regulatory systems, we can make a big difference in the sustainable development of the future. You can also check out this post at Tindale-Oliver & Associates. Tonight I had the awesome pleasure of hanging out with some friends to watch the documentary, Urbanized by Gary Hustwit. Just recently released on DVD in 2012, this was my first opportunity to see this inspiring film about world-famous architects’ and planners’ strategies for urban design solutions in cities across the globe. First, let me start with a side note. My husband and I got bikes this past weekend. How could we not? With perfect weather, a well-connected neighborhood with pleasant streetscapes, and always feeling like we’re on vacation, it would seem wrong not to. While I’ve always been a fan of cycling for leisurely purposes, tonight I did something I’ve never done before: I cycled for mobility purposes. One might think this is pretty bad since I am an urban designer, but this is the first city I’ve lived in where all the factors have come together to make it possible…well for me. Charlotte = disconnected, very few mixed uses, and spread out; Boston = umm, 4 feet of snow? ; St. Louis = dense college campus easy to walk around and not particularly needed; Baltimore = anyone seen The Wire? ; England = umm, rain…all. the. time. So how suitable that on the way to see Urbanized, we practiced urbanism at its best. Because our destination had little and paid parking, and was easily accessible with bike paths, we made a choice (because it was available), to ride our bikes. So as a disclaimer, I started watching this film in a very empowered state. It was a wonderful feeling to be given the option to make a sustainable and healthy choice, and then choosing to make it. This film was inspiring, empowering, and motivating at many times. As we watched some of the greats: Ellen Dunham-Jones, Amanda Burden, and my all time favorite, Jan Gehl, do their usual thang, there were some other characters that really shined: Enrique Penalosa, the former mayor of Bogota, Candy Chang, an artist who uses public space to share information, and Yung Ho Chang, an architect in Beijing. This film made my love affair with the former continue to grow, and with the latter, blossom. Ellen Dunham-Jones, Amanda Burden, Jan Gehl, Enrique Penelosa, Cindy Chang, and Yung Ho Chang. This film made me feel two things: inspired and a citizen of the world. Perhaps it was because I was watching it with five young people who share the same goals and belief that they can make a change, and a loving husband who is always committed to learn more about my passions. Or perhaps because this film reconfirmed for me that I have chosen the career where my talents and passions most meat the needs of the world. Or perhaps because I was watching the rock stars of my profession say things that made me feel warm and fuzzy inside. I felt like a citizen of the world because the film concentrated on cities all over the globe, some of which I was completely unfamiliar with. As Americans we sometimes find it hard to look beyond our boundaries to how other countries handle the same problems. This of course is not unique to us. As a planning student in the classroom and local councils in England there was no time or energy to look beyond the new planning system policies. And of course there is this view by some, that we live in one of the greatest countries with the most educated visionaries in the world. We got ourselves into this mess, can’t we fix our problems on our own? That may be true, but enter Enrique Penalosa of Bogota, Colombia. Who would think to look to Bogota as an example of cycling culture? Amsterdam? Yes. Copenhagen. Sure. Bogota? Not Really. This guy is awesome. With a population of over 6 million people, Bogota had the growing problem of maintaining infrastructure and traffic congestion. To fix the latter, he recognized the stigma associated with traditional buses (also alive and well here in America), and introduced a bus rapid transit (BRT) system to strengthen ridership. Acknowledging the more affordable cost versus rail and its necessary adaptability of routes in the future it was a perfect solution (and one that should be used WAY more often here.) But what was really creative was that the stations appeared and felt more like a subway stop than a bus stop. Elevated platforms, automated ticket machines, and flashy stations made taking this bus modern, relevant, professional, and cool. In addition Penelosa put money into a very complex and extensive dedicated cycle network throughout the city. As opposed to linear routes favored by American cities along well-used corridors, Bogota has a mesh grid of paths that infiltrate the city making cycling the favored choice of citizens to get, well, anywhere. Amazing right? Penelosa made clear that first money went to the bike paths, and then to the roads. The film showed cars navigating bumpy dirt roads full of potholes, while cyclists zoomed by on their bikes. Penelosa made Bogota put their money where their mouth is…he got shi*t done in who knows what political opposition. The result of having state of the art, first-world cycling routes, and in some occasions third-world car lanes is inspiring. 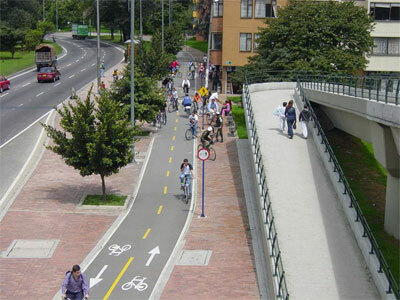 Enrique Penelosa, former mayor of Bogota’s lasting contributions: BRT and cycle network. Another of my favorites was Candy Chang who works in New Orleans. As she passed delapidated and abandoned buildings throughout the city, she had the idea of using the boarded up windows as a means of communication. Leaving name tags simply stating, “I wish this was a…” and a sharpie she was able to communicate with the whole city. But what really struck a chord with me was that she said “today it is easier to reach out to the entire world, then to communicate with your own neighborhood.” Man, how true this is. And how I wish it wasn’t this way. Any finally there was Yung Ho Chang who simply shared his memories of taking walks with his parents around the city as a child and running into his friends. As Beijing is viewed as a thriving and healthy city by most, he sadly stated that Beijing has lost its liveability…and that it didn’t need to happen. Perhaps what struck me most about Chang was that when he said this you could see in his eyes that he was mourning the loss of his city as he once knew it. Finally, Urbnized addressed the controversy of Stuttgart 21 in Germany. While I am sure with a little research I could write a whole blog series (and probably more well-balanced) on this one topic, what almost brought me to tears was watching hundreds of people put themselves in harms way to desperately, carelessly, and heartfully try to stop the demolition of a group of hundred year old oak trees. It was heartbreaking to watch a grown man wipe his tears as he watched them pulled down in seconds by a bulldozer. After all, even during WWII when the city was desperate for firewood to stay warm, they never dared touched those trees. The film left it unexplained, but I imaged that they stood defiantly representing the beauty of nature in the country’s most uncertain times. The heartbreaking attempt of protesters to try to save the beloved trees in the way of Stuttgart 21. Based on your mood this film will pull at your heart strings and turn you into a sappy mess, or pull at your “brain strings” and challenge you intellectually, and in time as I recover from my inspiring and empowering evening, will probably do both.